Sound analysis by the cochlea relies on frequency tuning of mechanosensory hair cells along a tonotopic axis. To clarify the underlying biophysical mechanism, we have investigated the micromechanical properties of the hair cell’s mechanoreceptive hair bundle within the apical half of the rat cochlea. We studied both inner and outer hair cells, which send nervous signals to the brain and amplify cochlear vibrations, respectively. We find that tonotopy is associated with gradients of stiffness and resting mechanical tension, with steeper gradients for outer hair cells, emphasizing the division of labor between the two hair-cell types. We demonstrate that tension in the tip links that convey force to the mechano-electrical transduction channels increases at reduced Ca2+. Finally, we reveal gradients in stiffness and tension at the level of a single tip link. We conclude that mechanical gradients of the tip-link complex may help specify the characteristic frequency of the hair cell. The cochlea—the auditory organ of the inner ear—is endowed with a few thousands of mechanosensory hair cells that are each tuned to detect a characteristic sound frequency (Fettiplace and Kim, 2014). Different frequencies are detected by different cells, which are spatially distributed in the organ according to a frequency or tonotopic map (Lewis et al., 1982; Greenwood, 1990; Viberg and Canlon, 2004). Despite its critical importance for frequency analysis of complex sound stimuli, determining the mechanism that specifies the characteristic frequency of a given hair cell remains a major challenge of auditory physiology. Although certainly not the only determinant of hair-cell tuning (Fettiplace and Fuchs, 1999), we focus here on the contribution of the hair bundle, the cohesive tuft of cylindrical processes called stereocilia that protrude from the apical surface of each hair cell. The hair bundle works as the mechanical antenna of the hair cell (Hudspeth, 1989). Sound evokes hair-bundle deflections, which modulate the extension of elastic elements—the gating springs—connected to mechanosensitive ion channels. By changing the elastic energy stored in the gating springs, sound stimuli affect the channels’ open probability, resulting in a mechano-electrical transduction current. Importantly, mechanical stress is conveyed to the mechano-electrical transduction channels by oblique proteinaceous tip links that interconnect the stereocilia near their tips (Pickles et al., 1984; Kazmierczak et al., 2007). Whether or not the tip link embodies the gating spring, however, is unsure. Electron microscopy (Kachar et al., 2000) and molecular dynamics simulations (Sotomayor et al., 2010) have suggested that the tip link may be too rigid and thus that a compliant element in series with the tip link could determine the gating-spring stiffness. If so (but see Bartsch et al., 2018), the gating spring could reside within the assemblies of molecules that anchor both sides of the tip link to the actin core of the stereocilia (Michalski and Petit, 2015), or perhaps be associated with membrane deformations at the lower insertion point of the tip link (Powers et al., 2012). In the following, the molecular assembly comprising the tip link, the transduction channels, as well as the molecules to which they are mechanically connected will be called the ‘tip-link complex’. The operating point of the transducer lies within the steep region of the sigmoidal relation between the transduction current and the hair-bundle position (Corey and Hudspeth, 1983; Russell and Sellick, 1983; Johnson et al., 2011). This key condition for sensitive hearing is thought to be controlled by tension in the tip links at rest (Hudspeth and Gillespie, 1994; Gillespie and Müller, 2009), as well as by extracellular and intracellular calcium (Corey and Hudspeth, 1983; Ricci et al., 1998; Fettiplace and Kim, 2014), which is thought to stabilize the closed state of the transduction channels (Hacohen et al., 1989; Cheung and Corey, 2006). Tip-link tension has been estimated at ~8 pN in the bullfrog’s sacculus (Jaramillo and Hudspeth, 1993) but, to our knowledge, there has been no such report in the mammalian cochlea. Adaptation continuously resets the mechanosensitive channels to a sensitive operating point when static deflections of the hair bundle threaten to saturate mechanoelectrical transduction (Eatock, 2000). Most of the available evidence indicates that movements by molecular motors actively pulling on the tip links and calcium feedback on the open probability of transduction channels contribute to adaptation. With mammalian cochlear hair cells, however, the dependence of adaptation on Ca2+ entry has recently been the subject of significant controversy (Peng et al., 2013; Corns et al., 2014; Peng et al., 2016; Effertz et al., 2017). Motor forces and calcium feedback can also explain the active hair-bundle movements, including spontaneous oscillations, that have been observed in various species (Fettiplace and Hackney, 2006; Martin, 2008). Active hair-bundle motility may contribute to hair-cell tuning by actively filtering and amplifying sound inputs (Hudspeth, 2008). These findings emphasize the importance of the tip-link complex, including the transduction channels, the tip links that convey sound-evoked forces to these channels, as well as the molecular motors that pull on the tip links, for mechanosensitivity of the hair cell. Electrophysiological properties of the transduction apparatus, including the activation kinetics and the conductance of the transduction channels, as well as the kinetics of adaptation, have been shown to vary with the characteristic frequency of the hair cell (Ricci et al., 2003; Ricci et al., 2005; Fettiplace and Kim, 2014; Beurg et al., 2018). These observations suggest that hair-cell tuning may depend on the transducer itself (Ricci et al., 2005). In addition, it is a ubiquitous property of vertebrate auditory organs that the morphology of the hair bundle varies systematically with the characteristic frequency of the corresponding hair cell (Wright, 1984; Lim, 1986; Roth and Bruns, 1992; Tilney et al., 1992): going from the high-frequency to the low-frequency region of the organ, the hair bundle gets longer and comprises a progressively smaller number of stereocilia. These morphological gradients have long been recognized as circumstantial evidence that the mechanical properties of the hair bundle might be involved in frequency tuning (Turner et al., 1981; Flock and Strelioff, 1984; Fettiplace and Fuchs, 1999). However, a detailed characterization of mechanical gradients at the level of the whole hair bundle is lacking, in particular to clarify the contribution of the tip-link complex to these gradients. In this work, we probed passive and active hair-bundle mechanics along the tonotopic axis of an excised preparation of the rat cochlea, within an apical region dedicated to the detection of relatively low sound frequencies for this animal species (1‒15 kHz; Figure 1). We worked both with inner hair cells, which convey auditory information to the brain and are considered the true sensors of the organ, and with outer hair cells, which are mostly dedicated to cochlear amplification of sound-evoked vibrations (Hudspeth, 2014). We combined fluid-jet stimulation to deflect the hair bundle, iontophoresis of a calcium chelator (EDTA) to disrupt the tip links and measure bundle movements resulting from tension released by these links, and patch-clamp recordings of transduction currents to infer the number of intact tip links contributing to the response. From these measurements, we estimated the stiffness of the whole hair bundle, the contribution of the tip links and of the stereociliary pivots to this stiffness, as well as the resting tension in the tip links. Our results reveal mechanical gradients of the tip-link complex according to the tonotopic map and to the division of labor between sensory inner and amplificatory outer hair cells, providing evidence for the implication of the tip-link complex to frequency tuning of cochlear hair cells. Hair-bundle stimulation along the tonotopic axis of the rat cochlea. (A) Schematic representation of the tonotopic axis of the rat cochlea. Recordings were made at locations marked by black disks, corresponding to characteristic frequencies (in kHz) increasing from the apex to the base of the cochlea as indicated on the figure and to fractional distances from the apex of 5%, 10%, 20%, and 50%. We report measurements from both inner and outer hair cells at the 1‒4 kHz locations, but only from inner hair cells at the 15-kHz location. The rat cochlea was typically 10 mm long. Adapted from Viberg and Canlon (2004). (B) Schematic layout of the experimental pipettes around a given outer hair cell. We combined fluid-jet stimulation of single hair bundles, iontophoresis of a Ca2+ chelator (EDTA), patch-clamp recordings of transduction currents, and perfusion of low-Ca2+ saline. (C) Schematic representation of the fluid-jet pipette and of a hair bundle (left) and micrograph of a fluid-jet pipette ready to stimulate an outer hair cell of the rat cochlea (right). A positive (negative) deflection of the hair bundle, as defined on the drawing, was elicited by fluid suction (ejection) into (from) the pipette, promoting opening (closure) of the transduction channels. The horizontal projected distance between the mouth of the pipette (blue vertical line) and the hair bundle (green vertical line) was set at ~8 µm. 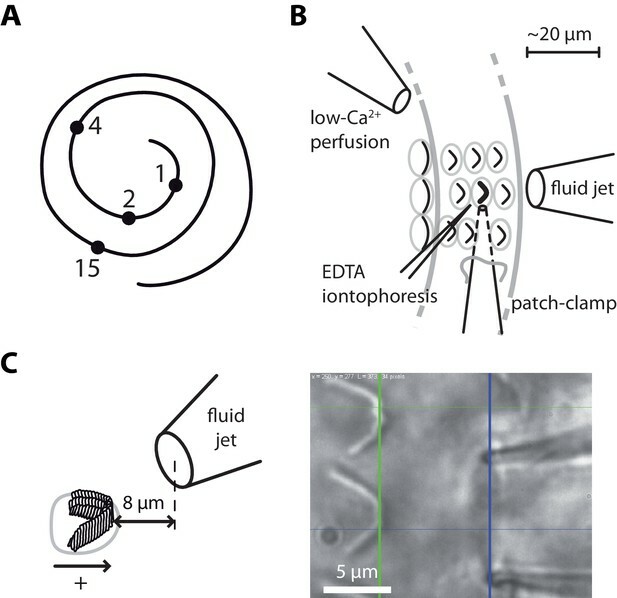 Using a calibrated fluid jet (Materials and methods; Figure 2—figure supplements 1–5), we applied force steps to single hair bundles along the tonotopic axis of the rat cochlea, going from the very apex of the organ to mid-cochlear locations (Figure 1). Each position along the tonotopic axis is associated with a characteristic frequency of sound stimulation at which the hair cell is most sensitive in vivo (Viberg and Canlon, 2004). For inner hair cells, we probed four positions, corresponding to characteristic frequencies that varied over nearly four octaves (1–15 kHz). For outer hair cells, we worked at the same three most apical positions as for inner hair cells and the characteristic frequency spanned two octaves (1–4 kHz). Because technical constraints precluded measurements at more basal locations (see Materials and methods), we could only explore a fraction of the tonotopic axis (50% for inner hair cells, 20% for outer hair cells). Each hair bundle responded to a force step with a fast deflection in the direction of the stimulus followed by a slower movement in the same direction (Figure 2; Figure 2—figure supplement 5A). Over the duration of the step, the deflection of the hair bundle increased in the direction of the applied step on average by 22% for inner hair cells and by 12% for outer hair cells, corresponding to an apparent softening of the hair bundle by the same amount. A mechanical creep is expected from mechanical relaxation of tip-link tension associated with myosin-based adaptation (Hudspeth, 2014). Accordingly, the creep was strongly reduced upon tip-link disruption by EDTA treatment (Figure 2—figure supplement 5). Stiffness gradients of the hair bundle. (A) Hair-bundle movements (top) in response to a series of force steps (bottom) for outer hair cells (OHC) with characteristic frequencies of 1, 2, and 4 kHz (from left to right). (B) Force-displacement relations for the data shown in (A), with black disks, white disks and black triangles corresponding to characteristic frequencies of 1, 2, and 4 kHz, respectively. (C) Hair-bundle movements (top) in response to a series of force steps (bottom) for inner hair cells (IHC) with characteristic frequencies of 1, 2, 4, and 15 kHz. (D) Force-displacement relations for the data shown in (C), with black disks, white disks, black triangles, and white squares corresponding to characteristic frequencies of 1, 2, 4, and 15 kHz, respectively. (E) Stiffness (ΚHB) of a hair bundle under control conditions as a function of the characteristic frequency (CF) for inner (white disks) and outer (black disks) hair cells. Each data point in (E) is the mean ± standard error of the mean (SEM) with the number of cells indicated between brackets. For outer hair cells, we found that a given series of force steps evoked hair-bundle deflections that decreased in magnitude towards more basal locations along the tonotopic axis (Figure 2A). Correspondingly, the slope of a bundle’s force-displacement relation (Figure 2B), and thus stiffness, increased with the characteristic frequency of the hair cell. The same behavior was observed for inner hair cells (Figure 2C-D). Remarkably, the stiffness gradient was steeper (*p<0.05; Figure 2—source data 1) for outer hair cells than for inner hair cells (Figure 2E). As the characteristic frequency increased from 1 to 4 kHz, the hair-bundle stiffness ΚHB increased by 240% from 2.5 ± 0.2 mN/m (n = 19) to 8.6 ± 0.5 mN/m (n = 21) for outer hair cells, but only by 120% from 1.7 ± 0.2 mN/m (n = 19) to 3.8 ± 0.4 mN/m (n = 19) for inner hair cells. At the 15-kHz position, where stiffness could only be recorded for inner hair cells (see Materials and methods), KHB = 5.5 ± 0.4 mN/m (n = 14), thus still significantly lower (***p<0.001; Figure 2—source data 1) than in outer hair cells at the 4-kHz position. At each cochlear position, outer hair-cell bundles were stiffer than inner hair-cell bundles, with a stiffness ratio that increased from the apex to the base of the organ. As also observed by others using fluid-jet stimulation of cochlear hair cells (Géléoc et al., 1997; Corns et al., 2014), we measured force-displacement relations that were remarkably linear (Figure 2B and D), showing no sign of gating compliance (Howard and Hudspeth, 1988). There are at least two possible explanations for this observation. First, the rise time (~500 µs; Figure 2—figure supplement 3) of our fluid-jet stimuli may have been too long to outspeed fast adaptation, masking gating compliance (Kennedy et al., 2003; Tinevez et al., 2007). Second, gating forces – the change in tip-link tension evoked by gating of the transduction channels (Markin and Hudspeth, 1995) − may have been too weak to affect hair-bundle mechanics under our experimental conditions (Fettiplace, 2006; Beurg et al., 2008). There are two contributions to the stiffness of a hair bundle: ΚHB=ΚGS+ΚSP. First, hair-bundle deflections modulate the extension of the gating springs that control the open probability of the mechano-electrical transduction channels; we denote by ΚGS their contribution to hair-bundle stiffness. Second, bending of the actin core of the stereocilia at the stereociliary pivots, as well as stretching horizontal lateral links that interconnect the stereocilia, provides the remaining contribution ΚSP. Because the gating springs are in series with the tip links, disrupting the tip links affords a means to estimate both ΚGS and ΚSP. We used local iontophoretic application of a Ca2+ chelator (EDTA; Materials and methods and Figure 1) to disengage the Ca2+-dependent adhesion of the cadherin-related molecules forming each tip link (Kazmierczak et al., 2007). From the increased magnitude of the hair-bundle response to a given mechanical stimulus (see an example in Figure 4A), we found that the gating springs contributed up to 50% of the total hair-bundle stiffness ΚHB. Averaging over all inner and outer hair cells that we tested, the relative contribution of the gating springs was r=ΚGS/ΚHB= 22 ± 2 % (n = 71; Figure 3—figure supplement 1), where 1-r is the amplitude ratio of hair-bundle movements before and after tip-link disruption. Both inner and outer hair cells displayed a gradient of gating-spring stiffness ΚGS=r ΚHB (Figure 3A). Between the 1-kHz and the 4-kHz positions, the gating-spring stiffness increased by 520% for outer hair cells but only by 300% for inner hair cells. Similarly, the contribution ΚSP=1-r ΚHB of the stereociliary pivots to hair-bundle stiffness displayed tonotopic gradients for both inner and outer hair cells (Figure 3B). Stiffness gradients of the gating springs and of the stereociliary pivots. Stiffness (A) of the contribution of the gating springs (ΚGS=r ΚHB), (B) of a hair bundle after tip-link disruption, corresponding to the contribution of the stereociliary pivots (ΚSP=1-r ΚHB), (C) of a single stereociliary pivot (κ=ΚSP h2/NSP), and (D) of a single gating spring (kGS=KGS/(γ2NTL)) as a function of the characteristic frequency (CF) for inner (white disks) and outer (black disks) hair cells. These stiffnesses were calculated from measured values of the hair-bundle stiffness ΚHB (Figure 2), the amplitude ratio 1-r of hair-bundle movements before and after tip-link disruption (Figure 3—figure supplement 1), the hair-bundle height h and the number of stereocilia NSP (Figure 3—figure supplement 2), and the average number NTL of intact tip links (Figure 3—figure supplement 3). Each data point is the mean ± SEM; SEMs were calculated as described in the Materials and methods. Both the pivot stiffness ΚSP and the gating-spring stiffness ΚGS are expected to vary according to hair-bundle morphology. Hair bundles get shorter and are composed of more numerous stereocilia as one progresses from the apex to the base of the cochlea (Figure 3—figure supplement 2), which ought to promote higher stiffness values. Are morphological gradients sufficient to explain the observed stiffness gradients of the hair bundle? Accounting for morphology, we write ΚSP=κNSP/ h2 and KGS=kGS NTLγ2, in which h, NSP, NTL correspond, respectively, to the height, the number of stereocilia and the number of (intact) tip links of the hair bundle, whereas γ∝1/h is a geometrical projection factor (Figure 3—figure supplement 2 and Figure 3—figure supplement 3). Remarkably, the intrinsic rotational stiffness κ of a single stereocilium in outer hair cells remained the same across the positions that we explored (Figure 3C; Figure 3—source data 2). Similarly, with inner hair cells, there was no significant variation of the rotational stiffness between the 1- and 2-kHz locations as well as between the 4- and 15-kHz locations, although we observed an increase by 100% between the 2- and 4-kHz locations (Figure 3—source data 2). Averaging over the ensembles of outer and inner hair cells that we probed, the rotational stiffness κ= 1.2 ± 0.2 fN·m/rad (n = 79) in outer hair cells was about 140% higher than the value κ= 0.5 ± 0.1 fN·m/rad (n = 137) measured in inner hair cells. In contrast, the intrinsic stiffness kGS of a single gating spring increased by 180% from 1.3 ± 0.4 mN/m (n = 29) to 3.7 ± 0.7 mN/m (n = 17) in outer hair cells and by 240% from 0.5 ± 0.2 mN/m (n = 14) to 1.7 ± 0.3 mN/m (n = 30) in inner hair cells, for characteristic frequencies that increased from 1 to 4 kHz and from 1 to 15 kHz, respectively (Figure 3D). Thus, morphological gradients can account for the observed gradient in pivot stiffness ΚSP, but not for the observed gradient in gating-spring stiffness ΚGS and in turn for the whole hair-bundle stiffness ΚHB. The hair-bundle morphology is not the sole determinant of hair-bundle mechanics. We then estimated the mechanical tension in the tip links at rest, that is in the absence of an external stimulus. The transduction channels close when the tip links are disrupted, indicating that the channels are inherently more stable in a closed state (Assad et al., 1991; Beurg et al., 2008; Indzhykulian et al., 2013). In functional hair bundles, tip-link tension is thought to bring the operating point of the transducer within the steep region of the sigmoidal relation between the channels’ open probability and the position of the hair bundle, ensuring sensitive detection of hair-bundle deflections. If there is tension in the tip links, then disrupting these links must result in a positive offset in the resting position of the hair bundle (Assad et al., 1991; Jaramillo and Hudspeth, 1993). In response to iontophoresis of a Ca2+ chelator (EDTA), we observed a net positive movement ΔXR of the hair bundle at steady state, as expected if the tip links broke and released tension (Figure 4A). Consistent with tip-link disruption, this movement was associated with a decrease in hair-bundle stiffness, as well as with closure of the transduction channels and loss of transduction (Figure 4B). The positive offset in resting position upon tip-link disruption was observed at all positions that we explored along the tonotopic axis of the cochlea, both for inner and outer hair cells, demonstrating that the hair bundles were indeed under tension (Figure 5A). In addition, we observed that the magnitude of the evoked movement increased significantly (**p<0.01; Figure 5—source data 1) from 9 ± 3 nm (n = 13) to 45 ± 10 nm (n = 12) for outer hair cells with characteristic frequencies that increased from 1 to 4 kHz. In contrast, we observed no significant difference among inner hair cells with characteristic frequencies that varied within the 1–15-kHz range (p>0.05; Figure 5—source data 1): the positive offset was 21 ± 2 nm (n = 71) over the whole ensemble of inner hair cells. Mechanical and electrical response of a hair bundle to fluid-jet stimulation and fast calcium chelation. (A) An iontophoretic step of a calcium chelator (EDTA; top) elicited a biphasic movement of the hair bundle from an inner hair cell (bottom): the hair bundle first moved in the negative direction (arrowhead) and then in the positive direction. After iontophoresis, the position baseline was offset by ΔXR= +78 nm with respect to the resting position at the start of the experiment. A sinusoidal command to a fluid jet (middle) evoked hair-bundle movements (bottom) that increased in magnitude, here by 50%, after application of the iontophoretic step. Repeating the iontophoretic step elicited no further movement and the response to fluid-jet stimulation remained of the same magnitude. A similar behavior was observed with 101 inner and 44 outer hair cells. (B) An iontophoretic step of EDTA (top) also elicited biphasic variations of the transduction current: the inward current first increased (arrowhead) and then decreased. Before application of the calcium chelator, fluid-jet stimulation evoked a transduction current of 1.5-nA peak-to-peak magnitude; the open probability of the transduction channels was near ½. The transduction current was abolished by the iontophoretic step. Outer hair cell at the 4-kHz location; the same behaviour was observed with 17 outer hair cells. In (A–B), the command signal to the fluid-jet device was a 60-Hz sinusoid and we applied a −100-nA iontophoretic step on top of a +10-nA holding current. The hair bundles were exposed to 20-µM Ca2+. In (B), the dashed line indicates the current for which the transduction channels are all closed. Gradients in tip-link tension at rest. Offset ΔXR in the resting position of a hair bundle resulting from tension release in the tip links (A), tip-link tension TR=ΚSP ΔXR in the hair bundle (B) and tension tR=TR/(γ NTL) along the oblique axis of a single tip link (C) as a function of the characteristic frequency (CF) for inner (white disks) and outer (black disks) hair cells. The hair-bundle tension TR (B) was calculated as the product of the stereociliary-pivot stiffness ΚSP shown in Figure 3 and the data shown in (A); this tension is estimated along the bundle’s horizontal axis of mirror symmetry. The single tip-link tension tR was then deduced from the projection factor γ and the average number NTL of intact tip links in a hair bundle (Figure 3—figure supplement 3). Each data point in (A) is the mean ± SEM with the number of cells indicated between brackets; in (B–C), mean values and SEMs were calculated as described in the Materials and methods. As a result, within the range of cochlear locations that we explored, we measured a steep gradient of hair-bundle tension for outer hair cells but a comparatively weaker gradient (*p<0.05; Figure 5—source data 1) for inner hair cells (Figure 5B). Tension TR=ΚSP ΔXR in the hair bundle was estimated as the product of the pivot stiffness ΚSP and the positive offset ΔXR in resting position evoked by tip-link disruption (Materials and methods). The hair-bundle tension increased by nearly 13-fold from 18 ± 7 pN (n = 15) to 248 ± 59 pN (n = 17) for outer hair cells (characteristic frequencies: 1−4 kHz) but by only 3.3-fold from 24 ± 5 pN (n = 33) to 100 ± 22 pN (n = 12) for inner hair cells (characteristic frequencies: 1−15 kHz). Tension in the hair bundle resulted from the summed contributions of tension in individual tip links. Dividing the tension TR by the average number NTL of intact tip links in our recordings and projecting the result along the oblique axis of the tip links (projection factor γ) provided estimates of the tension tR=TR/γ NTL in a single tip link. Remarkably, the observed gradients in hair-bundle tension (Figure 5B) were not only due to an increase in the number of tip links that contributed to this tension (Figure 3—figure supplement 3), for tension in a single tip link also showed gradients (Figure 5C). The single tip-link tension was comparable in the two types of cells at the 1-kHz location: 4.7 ± 2.0 pN (n = 23) for outer hair cells and 5.9 ± 1.3 pN (n = 43) for inner hair cells. However, at the 4-kHz location, the single tip-link tension had increased by 620% to 34 ± 8 pN (n = 19) in outer hair cells but only by 170% to 16 ± 4 pN (n = 17) in inner hair cells; at the 15-kHz location, tip-link tension in inner hair cells was 19 ± 5 pN (n = 18). A linear regression of the relation between the single tip-link tension and the characteristic frequency confirmed that the gradient was significantly (*p<0.05; Figure 5—source data 1) steeper for outer hair cells. Note that we have estimated here the stiffness and tension of a single tip-link complex along the hair bundle’s axis of bilateral symmetry, which corresponds to the natural axis of mechanical stimulation in the cochlea. If the horizontal projection of tip links was actually oriented at an angle with respect to this axis, stiffness and tension ought to be larger along the tip-link axis than the values reported here. A systematic change in tip-link orientation along the tonotopic axis would also affect the gradients. These effects are expected to be small in inner hair cells, which are endowed with nearly linear hair bundles, but could be relevant for the V-shaped hair bundles of outer hair cells (Figure 3—figure supplement 2 and Pickles et al., 1987). The dynamic response to an iontophoretic step of EDTA, and thus to a decrease of the extracellular Ca2+ concentration, was biphasic. The hair bundle first moved in the negative direction (arrowhead in Figure 4A), before the directionality of the movement reverted and the bundle showed the positive movement associated with tip-link disruption. The negative movement was associated with an increased inward current of similar time course (Figure 4B). Within the framework of the gating-spring model of mechanoelectrical transduction (Corey and Hudspeth, 1983; Markin and Hudspeth, 1995), this observation is readily explained if the evoked decrease in the extracellular Ca2+ concentration resulted in an increase in gating-spring tension, which both pulled the hair bundle in the negative direction and led to the opening of the transduction channels. The magnitude of the negative movement at the peak showed no significant gradient and was similar between inner and outer hair cells, with an average magnitude of ΔXCa=−26 ± 2 nm over the whole ensemble of hair cells (n = 83; Figure 6A). However, because morphological gradients (Figure 3—figure supplement 2) resulted in gradients of pivot stiffness ΚSP (Figure 3B), the maximal increase ΔT=−KSP ΔXCa in hair-bundle tension was larger for hair cells with higher characteristic frequencies (Figure 6B), as was the maximal tension tmax that a single tip link sustained before tip-link disruption (Figure 6C). Going from the 1-kHz location to the 4-kHz location, this maximal tip-link tension displayed a gradient from 14 ± 4 pN (n = 30) to 54 ± 12 pN (n = 23) in outer hair cells and from 15 ± 3 pN (n = 49) to 44 ± 8 pN (n = 39) in inner hair cells; the maximal tension in inner hair cells at the 15-kHz location was not significantly different than at the 4-kHz location. When immersing the hair cells in low-Ca2+ saline, the negative movement was always followed by tip-link disruption and could thus not be observed twice with the same hair bundle. However, in six different preparations for which the hair bundle was immersed in saline with a higher Ca2+ concentration (500 µM) than usual (20 µM), we were able to preserve the integrity of the tip links and demonstrate that the negative movements could be reversible (Figure 6D). Under such conditions, we observed that the absolute magnitude and the speed of the negative movement increased with the magnitude of the iontophoretic current. Notably, the hair bundle reached a new steady-state position when the iontophoretic step was long enough (Figure 6E), suggesting that resting tension in the tip links could be modulated by the extracellular Ca2+ concentration, with higher tensions at lower Ca2+ concentrations. Tensioning of the tip links at decreased Ca2+ concentrations. The amplitude of the negative hair-bundle movement ΔXCa (A), of the maximal increase ΔT=-ΚSP ΔXCa in hair-bundle tension (B), and of the maximal tension tmax=tR+ΔT/(γ NTL) in a single tip link (C) are plotted as a function of the hair cell’s characteristic frequency (CF). The tension increase in (B) was calculated from the stiffness ΚSP of the stereociliary pivots (Figure 3B) and the data shown in (A). The single tip-link tension tmax was then deduced from the tension at rest tR in a single tip link (Figure 5c), the projection factor γ (Figure 3—figure supplement 2) and the average number NTL of intact tip links (Figure 3—figure supplement 3). (D) Current-step commands (top) applied to an iontophoretic pipette containing the Ca2+ chelator EDTA evoked reversible negative movements of the hair bundle (bottom). (E) When the stimulus (top) was long enough, the hair bundle position could reach a steady state (bottom), corresponding to higher resting tension in the tip links. In (A–C), the hair bundles were immersed in low-Ca2+ saline, for which EDTA iontophoresis led to tip-link disruption. Positions and tensions were estimated at the point of polarity reversal of the hair-bundle movement (see Figure 4A), thus at the initiation of tip-link disruption, where the hair bundle reached its largest deflection in the negative direction and tension was thus maximal. Black and white disks correspond to outer and inner hair cells, respectively. Each data point in (A) is the mean ± SEM with numbers of cells indicated between brackets; in (B–C), mean values and SEMs were calculated as described in the Materials and methods. In (D–E), the hair bundles were immersed in a saline containing 500-µM Ca2+; this higher Ca2+ concentration preserved the integrity of the tip links upon EDTA iontophoresis. Tonotopy of the mammalian cochlea is known to be associated with gradients of hair-bundle morphology (Wright, 1984; Lim, 1986; Roth and Bruns, 1992; Tilney et al., 1992), as well as of electrophysiological properties of the transduction apparatus (Ricci et al., 2003; Ricci et al., 2005; Fettiplace and Kim, 2014; Beurg et al., 2018). The work presented here reveals that tonotopy is also associated with gradients of intrinsic mechanical properties of the hair cell’s tip-link complex. Specifically, by dissecting the relative contributions of the tip links and of the stereociliary pivots to the micromechanical properties of the hair bundle, we found that the gating springs that control the open probability of the mechanoelectrical transduction channels are stiffer (Figure 3D) and subjected to higher mechanical tension (Figure 5C) in hair cells that respond to higher characteristic frequencies. In return, our data raises the possibility of a mechanical role of the tip-link complex in the process that sets the characteristic frequency of the hair cell, at least within the apical cochlear region that we probed in this study. Whether or not stiffness and tension of the tip-link complex continue increasing toward more basal locations remains to be determined. The stiffness ΚHB of the whole hair bundle displayed steeper gradients than those expected using the rough estimate ΚHB∝NSP/h2 from morphological changes (Figure 3—figure supplement 2) in height h and number of stereocilia NSP. Computing the stiffness ratio between the most basal and the most apical cochlear location that we were able to probe, the measured stiffness ratios (Figure 2E) were ~50% and ~70% larger than those expected from morphology for outer and inner hair cells, respectively. We interpret this result as the consequence of intrinsic gradients of the single gating-spring stiffness (Figure 3D). Further emphasizing mechanical regulation at the level of the tip-link complex, we also observed that the rotational stiffness of a single stereocilium was nearly uniform across the cochlear locations that we tested, especially in outer hair cells (Figure 3C). Stiffness gradients of hair bundles with disrupted tip links are thus entirely determined by morphology, in contradistinction to those observed with intact hair bundles. Our experiments were performed with hair cells from juvenile animals (P7-P10), before the onset of hearing. Hair-cell maturation progresses from base to apex in the cochlea (Wu and Kelley, 2012), which may thus have affected our estimates of mechanical gradients of the tip-link complex. However, because 92% of our recordings were performed at P8 or later (Materials and methods), the tip-link complex ought to be nearly mature in our experiments, at least in outer hair cells (Roth and Bruns, 1992; Waguespack et al., 2007; Beurg et al., 2018). In inner hair cells, we cannot exclude that maturation of the hair-bundle morphology was still proceeding at the most apical cochlear positions explored in our study (Peng et al., 2009). Maturation sharpens the apex-to-base gradient of bundle height (Roth and Bruns, 1992); based on bundle morphology only, we would expect to underestimate stiffness gradients with immature inner hair cells. Within the tip-link complex, transmembrane channel-like protein isoforms 1 and 2 (TMC1 and TMC2) are thought to be essential components of the transduction channels (Fettiplace and Kim, 2014; Pan et al., 2018). TMC2 is only transiently expressed after birth; TMC1 is expressed later than TMC2 but is fundamental to mechanoelectrical transduction of mature cochlear hair cells (Kawashima et al., 2011; Kim and Fettiplace, 2013). Stereociliary expression levels of TMC1, as well as their tonotopic gradients, were recently shown in mice to be nearly mature by P6, both in inner and outer hair cells, but TMC2 may still be present in apical inner hair cells until about P13 (Beurg et al., 2018). Because TMC2 confers larger Ca2+ permeability to the transduction channels (Kim and Fettiplace, 2013), the Ca2+ influx at rest in the inner hair cells at P8-P10 may have been larger than at more mature developmental ages, possibly lowering tip-link tension (Figure 6) and steepening its gradient. We observed that the hair-bundle stiffness increased by 240% over two octaves (1‒4 kHz) of characteristic frequencies for outer hair cells and by a similar amount but over 4 octaves (1‒15 kHz) for inner hair cells (Figure 2E). Whether or not stiffness would continue increasing along the same gradient toward more basal locations of the cochlea is unknown. If it were the case, we would expect a base-to-apex stiffness ratio of ~40 for outer hair cells, which is comparable to the base-to-apex ratio of characteristic frequencies in the rat cochlea (range: 0.5–50 kHz; Viberg and Canlon, 2004), but only of ~6 for inner hair cells. The interplay between the stiffness and mass of a hair bundle could in principle help specify the preferred frequency of vibration of the hair cell through passive mechanical resonance with sound stimuli (Frishkopf and DeRosier, 1983; Freeman and Weiss, 1990; Gummer et al., 1996; Holton and Hudspeth, 1983; Manley et al., 1988). The resonance frequency ωC=k/m of a spring-mass system is given by the square root of the system’s stiffness k divided by the mass m; it thus increases with stiffness, but relatively slowly. Assuming for simplicity that the bundle’s mass remains nearly the same along the tonotopic axis (Tilney and Tilney, 1988), two orders of magnitude in frequency must be produced by a 10,000-fold increase in stiffness, corresponding to much steeper gradients than those reported here. Alternatively, it has been proposed that the hair bundle could actively resonate with sound as the result of spontaneous oscillations (Martin et al., 2001; Hudspeth, 2008). Within this framework, the characteristic frequency is set by the frequency of the oscillator, which is expected to increase with the stiffness of the hair bundle (Vilfan and Duke, 2003; Tinevez et al., 2007; Martin, 2008; Barral et al., 2018). Notably, the relation may be steeper than that resulting from a passive spring-mass system, possibly approximating a linear dependence (Hudspeth et al., 2010). In this case, the stiffness gradient observed here (Figure 2E) for outer hair cells, but not for inner hair cells, could be steep enough to be a major determinant of the tonotopic map. Tip-link tension is thought to control the open probability of the transduction channels, with higher tension promoting opening of the channels (Hudspeth and Gillespie, 1994). On this basis, a gradient of tip-link tension (Figure 5C) ought to result in a gradient of open probability. Yet, it has been shown in outer hair cells that the channels’ open probability—the operating point of the transducer—remains remarkably uniform along the tonotopic axis, near a value of ½ (Johnson et al., 2011). To explain this observation, we note that the tension gradient for outer hair cells is associated with a gradient of single-channel conductance (Beurg et al., 2006; Beurg et al., 2015; Beurg et al., 2018). As a consequence, the magnitude of the Ca2+ influx into transducing stereocilia is expected to increase with the characteristic frequency of the hair cell. Manipulations that affect the extracellular or the intracellular Ca2+ concentration indicate that the transduction channels close at increased Ca2+ concentrations (reviewed in Fettiplace and Kim, 2014), possibly because the channels are harder to open when the Ca2+ concentration is higher near the channel’s pore (Cheung and Corey, 2006). Thus, the gradient of tip-link tension reported here (Figure 5C) may compensate for the effects of the conductance gradient on the open probability: channels with higher conductance impart higher Ca2+ influxes (closing the channels) but are also subjected to higher tension (opening the channels), perhaps maintaining an optimal operating point for the transducer at all cochlear locations. Tension in the tip links is thought to be produced actively by pulling forces from molecular motors interacting with the actin core of the stereocilia at the upper insertion point of the tip link (Gillespie and Müller, 2009). The observed tension gradient in turn implies that, towards basal cochlear locations, there are more motors or that each motor exerts higher forces than near the apex. Notably, the tip links of inner-hair-cell bundles were found to bear less tension than those of outer-hair-cell bundles (Figure 5B–C). This property qualitatively makes sense, for the open probability of the transduction channels is thought to be smaller in inner hair cells than in outer hair cells (Russell and Sellick, 1983). There is also no, or only a weak, gradient of the single-channel conductance in inner hair cells (Beurg et al., 2006; Beurg et al., 2018), which parallels the relatively weak gradient of tip-link tension observed here. The tip link is composed of the association of two cadherin-related proteins, cadherin-23 and protocadherin-15 (PCDH15) (Kazmierczak et al., 2007). Molecular dynamics simulations have suggested that a bend between extracellular cadherin (EC) repeats 9 and 10 of PCDH15 may confer some compliance to otherwise rigid tip links (Araya-Secchi et al., 2016). Tensions higher than ~10 pN are predicted to evoke complete unbending of EC9-10, resulting in significant stiffening of the tip link. Assuming that PCDH15 in the tip link forms a dimer (Kazmierczak et al., 2007; Ge et al., 2018) and that tip-link tension is equally shared by the two filaments, our estimates of tip-link tension (Figure 5C) are compatible with a contribution of the bending elasticity of EC9-10 to gating-spring stiffness at the apex of the rat cochlea, especially in inner hair cells. In outer hair cells, as one progresses from the very apex towards more basal cochlear locations, tension may quickly become too high to allow a bent conformation in EC9-10. At the 4 kHz location, we estimated a resting tip-link tension of ~35 pN. Taking the measured unfolding forces of Ig domains in titin as a reference (Rief et al., 1997), tip-link tension might actually be high enough to evoke unfolding of EC domains, at least under resting conditions or at physiological loading rates. Recent evidence suggests that unfolding a various number of EC domains may contribute to a gradation of gating-spring stiffness (Bartsch et al., 2018; Bartsch and Hudspeth, 2018). Notably, the estimated gradients of gating-spring tension (Figure 5C) were associated with gradients of gating-spring stiffness (Figure 3D): stiffer gating springs are subjected to more resting tension. Strain stiffening is a common phenomenon associated with the entropic elasticity of macromolecules, including the tip-link component PCDH15 (Bartsch et al., 2018), as well as with filamentous protein networks (Bustamante et al., 1994; Rief et al., 1997; Kang et al., 2009). A tension gradient may thus in part explain the existence of the observed gradient of gating-spring stiffness. Alternatively, the gating-spring stiffness could vary if the gating spring were composed of a variable number of compliant molecules operating in parallel and connected to a single tip link. Upon iontophoretic application of a Ca2+ chelator (EDTA), before tip-link disruption, we observed that the hair bundle first moved in the negative direction and that this movement was associated with a concomitant opening of the transduction channels (Figure 4). Calcium acts as a permeant channel blocker of the transduction channels (Fettiplace and Kim, 2014). Lowering the extracellular Ca2+ concentration is thus expected to increase the magnitude of the current flowing through open transduction channels but not to produce hair-bundle movements, at least as the result of block release only. A decrease of the extracellular Ca2+ concentration also promotes opening of the transduction channels (Hacohen et al., 1989; Johnson et al., 2011). Within the framework of the gating-spring model of mechanoelectrical transduction, channel opening must reduce gating-spring extension and in turn tension, fostering positive movements of the hair bundle. Thus, the observed negative movements cannot result from internal forces associated with channel gating. Instead, our observations are readily explained if the evoked reduction of extracellular Ca2+ concentration resulted in an increase of tip-link (and thus gating-spring) tension. If tip-link tension at rest is set by myosin molecular motors that pull on the tip links (Hudspeth and Gillespie, 1994), then the motor force must increase at decreased Ca2+ concentrations. Alternatively, a negative deflection would also be produced if lowering the extracellular Ca2+ concentration evoked stiffening (Martin et al., 2003; Beurg et al., 2008) or shortening of the gating springs, increasing tension in the tip links. However, this mechanism would result in a negative steady-state offset of the bundle’s resting position (Figure 6E) only if there were no or little myosin-based adaptation—usually called ‘slow adaptation’ (Hudspeth and Gillespie, 1994; Peng et al., 2013)—to relax the tension change and return the hair bundle near its initial resting position. Because we observed the mechanical correlate of slow adaptation in response to force steps (Figure 2—figure supplement 5), a Ca2+-dependent regulation of tip-link tension via a change of gating-spring stiffness or length appears unlikely. This inference may be relevant to recent data implicating the stereociliary membrane as a key regulator of transduction-channel gating. Calcium ions have indeed been proposed to interact extracellularly with the local lipid environment of the transduction channels, promoting lower values of the channels’ open probability (Peng et al., 2016). Our recordings (Figure 4B and Figure 6D–E) are consistent with this hypothesis but a change in membrane mechanics would not explain the observed steady-state increase in tip-link tension (Figure 6E) if slow adaptation happens in these cells (Figure 2—figure supplement 5). Interestingly, depolarization of rat outer hair cells was previously shown to evoke positive movements of the hair bundle (Kennedy et al., 2006). Both depolarization and chelation of extracellular Ca2+ are expected to reduce the intracellular Ca2+ concentration in the vicinity of the transduction channel’s pore. Yet, the directionality of active hair-bundle movements is opposite in the two studies, suggesting that the hair bundle can operate in two regimes (Tinevez et al., 2007). In the first regime (Kennedy et al., 2006), the response to Ca2+ changes is dominated by gating forces (Howard and Hudspeth, 1988) so that the resting tension in the tip links is nearly the same before and after application of the stimulus. In the other regime (our study), Ca2+-evoked changes of the resting tension in the tip links (Figure 6) dominate gating forces. In the chicken cochlea, depolarization of the hair cell was reported to evoke negative movements of the hair bundle (Beurg et al., 2013), a directionality in agreement with that found here (Figure 4A). In addition, it has been shown in the bullfrog’s sacculus (Tinevez et al., 2007) and the turtle’s cochlea (Ricci et al., 2002) that the response of different hair cells to a given Ca2+ change can be of either directionality and that the directionality of the response for a given hair cell can even be reversed by applying a position offset to the hair bundle. The two regimes of active hair-bundle motility can thus potentially coexist within the same hair cell, but only if gating forces are strong enough (Tinevez et al., 2007). We measured force-displacement relations that were remarkably linear (Figure 2B and D), showing no sign of gating compliance (Howard and Hudspeth, 1988). This observation confirms that gating forces were relatively weak under our experimental conditions, although others have shown that gating compliance can be measured with mammalian cochlear hair cells (Russell et al., 1992; Kennedy et al., 2005). Stiffness (Figure 2E) and tension (Figure 5B) gradients were steeper for outer hair cells, which serve primarily as mechanical amplifiers of sound-evoked vibrations, than for inner hair cells, the true sensors of the inner ear (Hudspeth, 2014). Other properties, such as the height of the hair bundle (Wright, 1984; Lim, 1986; Roth and Bruns, 1992) or the conductance of the transduction channels (Beurg et al., 2006; Beurg et al., 2018), show a similar behavior. Thus, the division of labor between inner and outer hair cells may impart more stringent regulatory constrains to outer hair cells to tune their mechanoreceptive antenna according to the local characteristic frequency of the cochlear partition. However, the exact contribution of the hair bundle to frequency tuning remains unsure and, more generally, the mechanism that specifies the characteristic frequency remains a fundamental problem in auditory physiology. This may be in part because frequency selectivity cannot be ascribed to one element only, for instance the passive resonant property of the basilar membrane that was characterized in the pioneering work of von Békésy (Von Békésy and Wever, 1960). Various models of cochlear mechanics instead indicate that the characteristic frequency emerges from an active dynamic interplay between somatic electromotility of outer hair cells (Ashmore, 2008) and the micromechanical environment, including the basilar and tectorial membranes, as well as the hair bundle (Nobili and Mammano, 1996; Hudspeth et al., 2010; O Maoiléidigh and Jülicher, 2010; Meaud and Grosh, 2011; Hudspeth, 2014; Reichenbach and Hudspeth, 2014). Mechanical tuning of the inner constituents of the cochlear partition appears to happen at many scales: from the mesoscopic scale of the basilar and tectorial membranes, to the cellular scale of the hair bundle and hair-cell soma, down to the molecular scale of the hair cell’s transduction apparatus. Our work demonstrates that tonotopy is associated, in addition to other factors, with stiffness and tension gradients of the tip-link complex. All experimental procedures were approved by the Ethics committee on animal experimentation of the Institut Curie; they complied with the European and French National Regulation for the Protection of Vertebrate Animals used for Experimental and other Scientific Purposes (Directive 2010/63; French Decree 2013–118). Experiments were performed on excised cochlear coils of Sprague Dawley rats (Janvier Labs) between postnatal day 7 and 10 (P7–P10), with 8% of the cells at P7, 75% at P8‒P9 and 17% at P10. The dissection of the cochlea followed a published procedure (Kennedy et al., 2003). In short, we cracked open the bony shell covering the cochlear tissue, unwound the cochlear tube from the modiolus, removed the stria vascularis, and gently peeled the tectorial membrane. Apical or middle turns of the organ of Corti were positioned under strands of nylon fibers in the experimental chamber. We recorded from inner hair cells at four positions along the longitudinal axis of the cochlea (Figure 1A), corresponding to fractional distances of 5%, 10%, 20%, and 50% from the cochlear apex. According to the tonotopic map in this species (Viberg and Canlon, 2004), these cells were tuned at characteristic frequencies of 1, 2, 4, and 15 kHz, respectively. We also recorded from outer hair cells but only at the first three positions along the tonotopic axis. We have attempted to record from outer hair cells farther toward the cochlear base, in particular at the 7 kHz location. However, our success rate was too low to get reliable estimates of tip-link tension and gating-spring stiffness, the primary goal of our work. Among possible reasons, basal outer hair cells might not withstand immersion in low-Ca2+ (~20 µM) saline, a condition that we used to disrupt the tip links. In addition, the hair bundles of outer hair cells are smaller towards the base; monitoring their movements from direct imaging on photodiodes (see ‘Microscopic apparatus’ below) thus gets harder because the contrast of the image is lower. The tissue was bathed in a standard saline containing 150 mM NaCl, 6 mM KCl, 1.5 mM CaCl2, 2 mM Na-pyruvate, 8 mM glucose and 10 mM Na-HEPES. In some experiments, we used a low-Ca2+ saline containing 150 mM NaCl, 6 mM KCl, 3.3 mM CaCl2, 4 mM HEDTA, 2 mM Na-pyruvate, 8 mM glucose, and 10 mM Na-HEPES. As measured with a Ca2+-sensitive electrode, this solution had a free Ca2+ concentration of 22 µM, similar to that found in rat endolymph (Bosher and Warren, 1978). All solutions had a pH of 7.4 and an osmotic strength of 315 mOsm·kg−1. Experiments were performed at a room temperature of 20‒25°C. The preparation was viewed through a ×60 water-immersion objective of an upright microscope (BX51WI, Olympus). The tip of individual hair bundles was imaged at a magnification of ×1000 onto a displacement monitor that included a dual photodiode. Calibration was performed before each recording by measuring the output voltages of the monitor in response to a series of offset displacements of the photodiode. For hair-bundle movements that did not exceed ±150 nm in the sample plane, the displacement monitor was linear. We used iontophoresis to apply the calcium chelator EDTA in the vicinity of a hair bundle (Figure 1B) and disrupt its tip links (Assad et al., 1991; Jaramillo and Hudspeth, 1993; Marquis and Hudspeth, 1997). Coarse microelectrodes were fabricated from borosilicate capillaries with a pipette puller (P97, Sutter Instrument); their resistance was 1 MΩ when filled with 3 M KCl and immersed in the same solution. In experiments, the electrodes were filled with a solution containing 100 mM EDTA and 25 mM KCl. The electrode’s tip was positioned at ∼3 μm from the hair bundle. A holding current of +10 nA was continuously applied to counteract the diffusive release of EDTA from the electrode. The stimulus consisted of a −100-nA current step on top of the holding current, resulting in a net iontophoretic current of −90 nA. To facilitate tip-link disruption upon EDTA iontophoresis, the cochlear tissues were immersed in low-Ca2+ saline (~20 µM Ca2+). The hair bundles of inner and outer hair cells were mechanically stimulated using a fluid-jet device (Kros et al., 1992; Géléoc et al., 1997; Johnson et al., 2011). Pipettes were pulled from borosilicate glass (TW150-F, World Precision Instruments); their tip diameter was adjusted within a range of 5‒10 μm. Fluid flow through a pipette was driven by a voltage command to a piezoelectric disk (Murata 7BB-27–4). Any steady-state flow coming in or out of the pipette was nulled by changing the hydrodynamic pressure inside the fluid-jet pipette; the hydrodynamic pressure was adjusted with a syringe connected to the body of the fluid-jet device. The fluid-jet pipette was positioned on the abneural side of the bundle along the hair bundle’s axis of mirror symmetry (Figure 1C). Fluid coming out the pipette thus deflected the hair bundles towards the shortest stereociliary row, closing the ion channels that mediate mechanoelectrical transduction. This direction of bundle movement is defined as the negative direction in this paper; conversely, positive movements were directed towards the tallest row of stereocilia, fostering opening of the transduction channels. Mechanical stimuli were applied as 100-ms paired-pulse steps (Figure 2 and Figure 2—figure supplement 3), or 60-Hz sinusoids (Figure 4) with the magnitude of driving voltages varying between 0 and 60 V.
For stiffness measurements, we measured hair-bundle movements evoked by 100-ms force steps (Figure 2; see the force-calibration procedure below). The bundle displacement was measured 5–10 ms after the onset of the step stimulus; the stiffness was given by the slope of the relation between the force (noted F in the following) and the displacement of the bundle’s tip. These measurements were performed in standard saline. where βHB=βw=12w(w/1+w2+tan-1⁡w) is a constant that depends on the normalized width of the hair bundle w=W/2A. Thus, calibrating the force FD is equivalent to calibrating the maximal fluid velocity Vmax. To estimate Vmax, we measured the force F¯D≅6πηRF U¯ applied by the same jet on a calibrated glass fiber, whose longitudinal axis was oriented perpendicularly to that of the fluid-jet pipette. Given the diameter DF of the fiber, the effective hydrodynamic radius of a cylindrical fiber was calculated as RF=2L/3ln⁡L/DF+0.84 (Tirado and de la Torre, 1979). Because the conical fluid jet intersected the fiber over a length L >W, the effective fluid velocity U¯≅∫−L/2+L/2vX(x,y) dy/L=βF Vmax for the fiber was smaller than the effective velocity U for the hair bundle, where βF=β(L/(2A))<βHB. In practice, we used Lx=2 x tan⁡α+DFJ, where α is the half-aperture of the conical fluid jet that was visualized using a dye (Coomassie Brilliant Blue; Figure 2—figure supplement 2) and DFJ is the diameter of the mouth of the fluid-jet pipette. We noticed that Lx≅ 2Ax (Figure 2—figure supplement 1; Figure 2—figure supplement 2). We used this property to estimate βHB≅βW/L and βF≅β1 without having to measure A directly in every experiment. In experiments, the projected horizontal distance between the tip of the fluid-jet pipette and the hair bundle or the fiber was fixed at x≅ 8 µm (mean ± SD: 7.8 ± 0.6 μm; range: 5.9–8.8 µm). Flexible fibers of diameters DF = 0.7–1.5 μm and stiffness kF = 0.2–2 mN/m were fabricated and calibrated as described before (Bormuth et al., 2014); their effective hydrodynamic radii varied within a range of RF= 2.5–3.2 µm. A fluid jet of given magnitude elicited a force F¯D=kFΔX, where ΔX is here the measured deflection of the fiber. The relation between the force F¯D applied to a fiber and the voltage command to the fluid-jet device was linear; its slope provided the calibration constant C (Figure 2—figure supplement 3). When stimulating a hair bundle, a voltage command VC to the fluid-jet device thus elicited a force FD≅GCVC, where G=FD/F¯D=(βHBRHB)/(βFRF). We used G = 1.4 ± 0.1 (mean ± SD; range: 1.27–1.65) for inner hair cells and G = 1.3 ± 0.1 (mean ± SD; range: 1.12–1.47) for outer hair cells. Thus, we estimate that the force applied on the hair bundle was 30–40% higher than that measured on the calibration fiber using the same jet of fluid. In practice, we calculated G in each experiment from the geometrical parameters of the fluid-jet pipette, the calibration fiber, and the hair bundle. Note that at a distance y=L/2 from the center of the fluid jet (y=0), the fluid velocity is expected to be 25% of the maximal value (see Equation 2 above). Thus, some of the moving fluid was not taken into account in our estimates of the force acting on the fiber, resulting in an underestimation. However, taking into account the velocity field up to y=L would result in an increase of G by only 5% while the fluid velocity at the edge of the fluid cone would be 4% of the maximal value . All the forces reported in this work correspond to the effective force F that one would have to apply at the bundle’s tip to evoke the same bundle deflection X as the hydrodynamic drag force FD actually exerted by the fluid jet and distributed over the height of the hair bundle. Correspondingly, the stiffness of the hair bundle was calculated as the slope of the force-displacement relation F(X). In the following, we develop an approximate description of hair-bundle mechanics to relate the effective force F to the drag force FD. Modeling the hair bundle as a pivoting solid (Kozlov et al., 2007; Kozlov et al., 2011), we write the torque produced by the fluid jet as Γ=∫0hf(z) z dz=κHB θ. Here, h is the height of the hair bundle, f is the drag force per unit (vertical) length experienced by the hair bundle at a vertical distance z from the apical surface of the hair cell, κHB is the rotational stiffness of the hair bundle, and θ≅X/h is the pivoting angle corresponding to the deflection X measured at the bundle’s top. With these notations, the total drag force on the hair bundle reads FD=∫0hfz dz. Assuming that the drag force per unit length f∝vz is proportional to the local fluid velocity vz and that the condition of no-slip at the apical surface of the hair cell (vz=0=0) imposes a linear velocity profile vz=vh z/h, we take f∝z. Injecting this expression into the integrals defining the torque Γ and the total drag force FD, we find Γ=23FDh. As a result, we identify the effective force F=23FD that must be applied at the bundle’s top to evoke the same torque as the fluid jet; the effective force F is smaller than the total drag force FD exerted by the fluid jet, corresponding to a ratio F/FD=2/3. To test our force-calibration procedure for the fluid jet, we performed a control experiment using hair-cell bundles from the sacculus of the frog (strain ‘Rivan92’ of Rana ridibunda [Neveu, 2009]). Details of the experimental preparation have been published elsewhere (Tinevez et al., 2007). In a similar preparation, the hair bundles have been shown to be very cohesive (Kozlov et al., 2007). As a result, the stereocilia are constrained to move as a unit in response to point-force application at the kinociliary bulb with a flexible fiber, allowing for well-controlled stiffness measurements (Martin et al., 2000; Bormuth et al., 2014). We compared stiffness estimates from stimulation with fluid jets and flexible fibers (Figure 2—figure supplement 4). From a sample of 13 hair bundles, we found a stiffness of 0.40 ± 0.17 mN/m (mean ± SD) using fluid-jet stimulation and of 0.42 ± 0.16 mN/m (mean ± SD) using fiber stimulation; the mean values of the stiffness estimates were not statistically different (paired-sample t-test). The good agreement between the two methods gave us confidence that the procedure that we used to calibrate the fluid jet is satisfactory. We used the patch-clamp technique to measure mechano-electrical transduction currents. Borosilicate patch pipettes were filled with an intracellular solution containing 142 mM CsCl, 3.5 mM MgCl2, 1 mM EGTA, 5 mM Na2-ATP, 0.5 mM Na2-GTP and 10 mM HEPES (pH = 7.3, 295 mOsmol/kg). When immersed in standard saline, these pipettes had a resistance of 1.5‒3 MΩ. A patch pipette was inserted in the organ of Corti through a pre-formed hole in the reticular lamina and approached parallel to the hair-cell rows toward the soma of a target hair cell. During the approach, standard saline was abundantly perfused to protect the Ca2+-sensitive tip-links from EGTA. Hair cells were whole-cell voltage clamped at a holding potential of −80 mV; transduction currents were low-pass filtered at 1–10 kHz (Axopatch 200B; Axon Instruments). No correction was made for the liquid-junction potential. The series resistance was always below 10 MΩ and was compensated up to 70%. To disrupt the tip links with EDTA iontophoresis, the solution bathing the cells was changed to low-Ca2+ saline after the cell was patched; the solution change was performed either with a perfusion or with a Picospritzer (Picospritzer III, Parker). Cochleae from P8 rats were processed with osmium tetroxide/thiocarbohydrazide, as previously described (Furness et al., 2008). Samples were analyzed by field emission scanning electron microscopy operated at 5 kV (Jeol JSM6700F). The number of stereocilia in inner and outer hair-cell bundles was estimated from electron micrographs at each of the cochlear locations where we performed mechanical and electrophysiological measurements (Figure 3—figure supplement 2; Figure 3—source data 1). We performed patch-clamp recordings of the transduction current IMAX elicited at saturation by large hair-bundle deflections (Figure 3—figure supplement 3). In inner hair cells, the number of intact tip links NTL=IMAX/I1 was calculated by dividing the saturated current IMAX for the whole hair bundle by the published estimate I1=35.4 pA for the transduction current flowing through the tip of a single transducing stereocilium (Beurg et al., 2009); electron microscopy has indeed shown that there is precisely one tip link per stereocilium in an intact hair bundle (Pickles et al., 1984; Kachar et al., 2000). We used the same value of I1 at all cochlear locations (Beurg et al., 2006; Beurg et al., 2018). Given the magnitude i=15 pA of the current flowing through a single transduction channel, there was on average I1/i=2.36 transduction channels per transducing stereocilium (Beurg et al., 2006). In outer hair cells, there is no direct estimate of I1. However, the unitary current i was shown to increase (Beurg et al., 2006; Beurg et al., 2015; Beurg et al., 2018) from 8.3 pA to 12.1 pA when the hair cell’s characteristic frequency increases from 4 kHz to 14 kHz (Beurg et al., 2006). All these currents were measured under the same experimental conditions as ours, in particular using a −80 mV holding potential and with the hair cells immersed in a standard saline containing 1.5 mM Ca2+. Assuming a linear relation between the unitary current and the position of the hair cell along the tonotopic axis of the cochlea (Beurg et al., 2015; Beurg et al., 2018), we inferred the unitary currents at other cochlear locations. We then assumed that the average number of transduction channels per tip link was 2.36, as estimated in inner hair cells (Beurg et al., 2009). The number of intact tip links was then calculated as IMAX/2.36 i. We performed this measurement for 10 hair cells at each cochlear location, both for inner and outer hair cells, to calculate the average number of intact tip links in any given hair cell. In these experiments, the hair cells were immersed in standard saline. Recent measurements in the mouse cochlea have revealed that unitary currents may represent an ensemble average over multiple conductance states, raising the possibility that these currents are produced by a few (up to 5) identical transduction channels that gate cooperatively (Beurg et al., 2018). This finding does not affect our estimates: the current that flows through a single stereocilium stays the same, whether or not it results from cooperative gating of multiple channels or from gating of an effective channel endowed with the same conductance as the total conductance of the group. All signals were generated and acquired under the control of a computer running a user interface programmed with LabVIEW software (version 2011, National Instruments). Command signals were produced by a 16-bit interface card at a sampling rate of 25 kHz (PCI-6733, National Instruments). A second 16-bit interface card (PCI-6250, National Instruments) conducted signal acquisition. Sampling rates for signal generation and acquisition varied within the range 2.5–25 kHz. All signals were conditioned with an eight-pole Bessel antialiasing filter adjusted to a low-pass half-power frequency at half the sampling rate of signal acquisition. Unless otherwise noted, all results are quoted as mean ± standard error of the mean (n) with a number n of cells of at least 10 per group. G-Power analysis ensured that this number was sufficient to achieve a signal-to-noise ratio of 1–1.5, with 80% power at a 5% significance level. We performed a one-way ANOVA to assay statistical significance of the measured mean-value variation of a given property, for example the hair-bundle stiffness, between the different cochlear locations for inner (IHC) or outer (OHC) hair cells. We also used two-tailed unpaired Student's t-tests with Welch’s correction when comparing mean values between two groups of a given hair-cell type (IHC or OHC) with different characteristic frequencies or between the two cell types (IHC/OHC) with a given characteristic frequency. Stars correspond to p-values with *p < 0.05, **p < 0.01, and ***p < 0.001, whereas ‘n.s.’ (p > 0.05) indicates non-significant differences. To determine whether variables estimated from the product of M independent variables Xi (i=1 .. M) had means that were statistically different, we first calculated the standard error of the mean σP of the product and the effective number of degrees of freedom νeff of the product. Defining Xi¯ the mean value, si the standard deviation, and σi= si/ni the standard error of the mean of variable Xi over ni measurements, the standard error of the mean for the product was calculated as σP=∏Xi¯ ∑(σiXi¯)2 and the effective number of degrees of freedom associated with the product was calculated using the Welch-Satterthwaite approximation as νeff= [σP/∏Xi¯]4/∑ 1ni−1(σiXi¯)4. Finally, we characterized tonotopic gradients by performing weighted linear regressions, in which the weight applied to each data point was given by the inverse of the squared standard error of the mean. We then applied a t-test on the resulting coefficients to determine whether the observed difference between the gradients measured with inner and outer hair cells was statistically significant. The results of all statistical analyses are listed in tables which are provided as source data associated to the main figures. The Journal of Neuroscience 3:962–976. Annual Review of Neuroscience 23:285–314. The Journal of Neuroscience 37:11632–11646. The Journal of Physiology 576:29–36. Annual Review of Physiology 61:809–834. Proceedings of the Royal Society of London. Series B: Biological Sciences 264:611–621. The Journal of the Acoustical Society of America 87:2592–2605. The Journal of Neuroscience 9:3988–3997. Springer Science & Business Media. The Journal of Physical Chemistry B 113:3799–3805. Journal of Clinical Investigation 121:4796–4809. The Journal of General Physiology 141:141–148. Proceedings of the Royal society London B: Biological Sciences 249:185–193. Aerosol Science and Technology 6:153–161. Journal of Comparative Physiology 145:437–445. Annual Review of Biophysics and Biomolecular Structure 24:59–83. The Journal of Neuroscience 23:4533–4548. In: G. A Manley, A. N Popper, R. R Fay, editors. Active Processes and Otoacoustic Emissions in Hearing. New York: Springer. pp. 93–143. Pflügers Archiv - European Journal of Physiology 467:49–72. The Journal of the Acoustical Society of America 99:2244–2255. The Journal of the Acoustical Society of America 128:1175–1190. Reports on Progress in Physics 77:076601. The Journal of Neuroscience 18:8261–8277. The Journal of Neuroscience 22:44–52. Proceedings ot the Royal Society London B: Biological Sciences 250:217–227. The Journal of Physiology 338:179–206. ZAMM - Zeitschrift Für Angewandte Mathematik Und Mechanik 13:260–263. Annual Review of Cell Biology 8:257–274. The Journal of Cell Biology 107:2563–2574. The Journal of Chemical Physics 71:2581–2587. Cold Spring Harbor Perspectives in Biology 4:a008409. Thank you for sending your article entitled "Tonotopy of the mammalian cochlea is associated with stiffness and tension gradients of the hair cell's tip-link complex" for peer review at eLife. Your article is being evaluated by Andrew King as the Senior Editor, a Reviewing Editor, and three reviewers. To convincingly demonstrate that the stiffness and tension in tip-link complex contributes to the tonotopy of the cochlea, reviewer #1 suggested that testing at 7 kHz location is warranted. 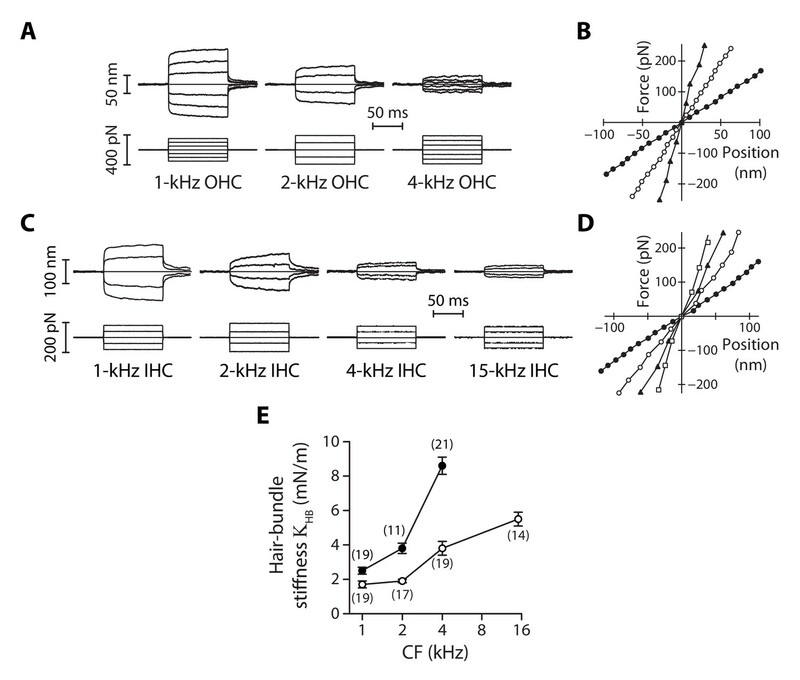 Although the authors have stated that testing outer hair cells farther towards the basal cochlea was technically difficult, it is not clear whether testing CF around 7kHz has been attempted. Without an additional CF higher than 4 kHz, it may be difficult to convince reviewer #1. Please respond within the next two weeks with an action plan and timetable for the completion of the additional work requested by all the reviewers. We plan to share your responses with the reviewers and then issue a binding recommendation on whether to invite a revision. This is a meticulous study of the mechanical properties of the hair bundles of rat cochlear hair cells. During transduction, hair bundle displacement opens mechanotransducer (MT) channels via increased tension in tip links connecting adjacent stereocilia. It is thought that each tip link is connected, directly or indirectly, to an MT channel. While the paper contains much quantitative material, the most important conclusion is that the mechanical stiffness of the tip-link complex increases towards the high-frequency end of the cochlea. This is surprising given that each tip link is composed a dimer of protocadherin15 connected to a dimer of cadherin 23, the stiffness of which should be independent of location. The paper also includes measurements of the MT current and bundle stiffness versus cochlear location, and the effects of calcium, though none of this is really new. A significant weakness of the paper is that only a small length, the apical 20 percent, of the cochlea is sampled to derive a tonotopic gradient for outer hair cells, the conclusion being extrapolated to the remaining 80 percent. It is unclear why more basal positions were not tested when earlier work (Beurg et al., 2006) had shown this to be feasible. To provide context, the authors study only 1 to 4 kHz, where the rat upper frequency limit is at least 50 kHz. I was also concerned with the tonotopic map derived from Viberg and Canlon, (2004), when the direct measurements were present in Muller, (1991). Muller did not measure CFs less than 4 kHz for the young (P13) rats, and using his values, I would assess CFs, of 2, 4 and 7 kHz for the three OHC locations. Another weakness was that the stiffness values do not agree with previous measurements (Geleoc et al., 1997 or Beurg et al., 2008). For example, this paper reports an OHC bundle stiffness of 12 mN/m at CF= 4kHz, whereas Beurg et al., (2008) reported 3.1 mN/m and Geleoc et al., 4.5 mN/m. The latter work was done with the same technique as used here. The rapid increase between 2 kHz and 4 kHz (Figure 3A) is suspicious. In view of these concerns, I feel the paper would be better placed in a less high-profile journal such as Biophysical Journal or JARO. 1) Impact statement: “The mechanical properties of the tip-link complex contribute to frequency selectivity of auditory hair cells”. See also subsection: “Tip-link complex plays a role in setting the CF of the hair cell.” To my knowledge there is no evidence to support these contentions. 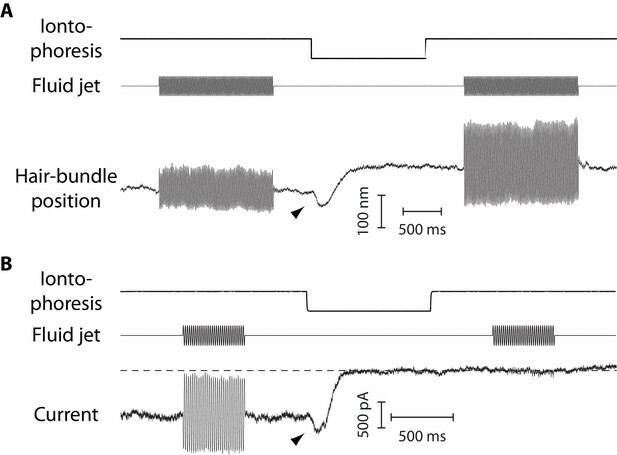 Moreover, the present consensus (see e.g., work by Grosh and colleagues) is that prestin-based somatic contractility is sufficient to account for cochlear amplification. 2) Discussion section. “Computing the relative difference in stiffness ratio between the two extreme cochlear locations”: are 1 and 4 kHz regarded as extreme locations? 3) Discussion section. The section relating stiffness to MT channel number is an intriguing suggestion, but the correlation is poor and not enough of the cochlea is examined. Is it possible there is an error either in determining location or allocating CFs? 4) Discussion section. Whether or not the channel gating force is manifest in the bundle's force-displacement plot depends mainly on the bundle's passive stiffness. For example, there is a strong non-linearity for the frog saccular hair bundle, where the passive stiffness is less than 0.5 nmN/m (Cheung and Corey, 2005). For mammalian hair bundles, less stiff vestibular bundles show more non-linearity than more stiff auditory bundles (Geleoc et al., 1997). The present results with stiffness of 12 mN/m would not be expected to show any non-linearity. Please add this. It has been recognized for more than a century that the frequency sensitivity of the cochlea varies along the organ's length, a property that is essential for our ability to recognize various sounds. The bases of this so-called tonotopic mapping have nevertheless remained uncertain. The basilar membrane itself displays a gradient in its mechanical properties, but that is far too shallow to account for the human hearing range of 20 Hz to 20 kHz. Individual hair bundles likewise vary systematically in their heights and numbers of stereocilia; again, these gradients cannot explain the observed gamut of frequencies. The conductances of individual transduction channels of hair cells-especially outer hair cells-show a tonotopic gradient, but that phenomenon seems to have no direct bearing on frequency selectivity. The present submission documents a novel and somewhat unexpected contribution to frequency tuning: a tonotopic gradient in the stiffness of hair bundles, in the stiffness of individual tip links, and in the tension that the links bear at rest. The work therefore constitutes an important contribution on a key issue in auditory physiology. The experimentation is of high quality and excellent statistical significance; the results are described clearly and succinctly. There is a problematic issue in subsection “The hair-bundle stiffness increases along the tonotopic axis”. It is surprising a first glance that the authors mention neither adaptation and the consequential changes in hair-bundle stiffness, nor gating compliance owing to the opening of transduction channels. This is worrisome inasmuch as the lack of these signatures might imply unhealthy cells. Only in subsection “Mechanical stimulation and stiffness measurements” do the authors report the time-dependent changes characteristic of adaptation, which they later demonstrate in Figure 2—figure supplement 4. Moreover, they subsequently mention the period of 5-10 ms after the onset of stimulation at which measurements were made, an interval likely to miss gating compliance owing to the swift adaptation of mammalian hair cells. Note in that context the transient at the outset of the single record with a high temporal resolution (Figure 2—figure supplement 3). Finally, in subsection “Tip-link tension depends on calcium” they state that "gating forces were relatively weak under our experimental conditions," when really their measurement conditions probably precluded the detection of these forces. It would be useful to state at the outset that the principal measurements reflect "steady-state" stiffnesses or the like, and perhaps to note that adaptation was probably observed but was not relevant, and that gating compliance might have been missed for technical reasons. This is an interesting manuscript that investigates tonotopic differences in hair bundle mechanical properties between inner and outer hair cells. The data are interesting, novel and rigorous. The work provides an important contribution to our knowledge base. Data show that OHCs are different from IHCs and that there is a tonotopic gradient for OHC properties. A novel finding of a BAPTA sensitive force also providing a tonotopic variation for OHCs is described and discussed. Overall a very good piece of work that provides important new information about mammalian cochlear hair bundles. 1) It is important to be clear that the changes observed with BAPTA treatment are not necessarily limited only to tip-link proteins but anything in series with these proteins. The tonotopic changes described may be a reflection of intrinsic tip link properties but they also can be a reflection of changes described for the TMC proteins, upper insertion point proteins and even the lipid bilayer. The authors do allude to this idea in several places (using the term tip link complex), but it comes across a bit confused and it is unclear when they mean only the tip-link proteins and when they include accessory structures. The discussion of potential intrinsic tip- link protein effects is reasonable, it simply needs to be expanded to be inclusive as there is no clear data one way or the other. 2) Does the tonotopic change in stereocilia height alter the force sensed from the fluid jet because of the apical surface either reflecting flow or adding a resistance to flow? That is, how sure are the authors that the stimulus to the hair bundle is constant between tonotopic positions? 3) Is it possible that the resting tip-link tension variations are a function of tonotopic membrane potential differences operating in a feedback to control driving force and perhaps calcium permeation? Similarly, is it possible that previously described tonotopic differences in calcium buffering might underlie the measured changes in resting tension? 4) Is there concern that the ages used overlap in timing with changes in TMC proteins switching? As development occurs tonotopically, might some of the observations here be due to different developmental states? 5) In subsection “Tip-link tension depends on calcium” the authors appear to be making a statement about adaptation and calcium effects. If they want to go this way, then they should be as quantitative here as they are in the rest of the manuscript. As the data presented here is consistent with that from the Peng papers where calcium dependent and independent effects are described, the calcium dependent effects are simply argued to be separate from adaptation, just as the upper tip link insertion motors are argued to be a tensioning mechanism independent of adaptation. Seems to me that the data presented in this manuscript does not actually directly address the topic of calcium and adaptation. The authors should either make a statement that includes a conclusion, present data on the topic, or eliminate the paragraph. 6) The last sentence of the manuscript implies that the tonotopic variations in the hair bundle mechanics support an argument that the hair bundle is part of the active process. It seems to me that the data in the manuscript argue that OHCs, which need to work cycle by cycle are mechanically different tonotopically and also from IHCs which do not need to operate cycle by cycle. The data supports an argument for the hair bundle providing some frequency selectivity, perhaps a tuning mechanism, which may or may not be active. It might be more valuable for the authors to better delineate what they are referring to when they say active process, do they mean amplification, do they mean tuning, do they mean both? Seems like a very loaded sentence. Thank you for resubmitting your work entitled "Stiffness and tension gradients of the hair cell's tip-link complex in the mammalian cochlea" for further consideration at eLife. Your revised article has been favorably evaluated by Andrew King (Senior Editor) and a Reviewing Editor and will be accepted for publication. However, two of the reviewers remain concerned about the claims relating to "tonotopy" in the manuscript. We accept the reasons given for not being able to obtain responses at the 7 kHz location, but this does mean that only 20% of the length of the cochlea was assessed. We therefore think it would be prudent to stress this in the paper to avoid giving a misleading impression about the range of frequency locations that were sampled. This is a meticulous study of the mechanical properties of the hair bundles of rat cochlear hair cells. During transduction, hair bundle displacement opens mechanotransducer (MT) channels via increased tension in tip links connecting adjacent stereocilia. It is thought that each tip link is connected, directly or indirectly, to an MT channel. While the paper contains much quantitative material, the most important conclusion is that the mechanical stiffness of the tip-link complex increases towards the high-frequency end of the cochlea. This is surprising given that each tip link is composed a dimer of protocadherin15 connected to a dimer of cadherin 23, the stiffness of which should be independent of location. Finding that the stiffness associated with the tip-link complex –the gating-spring stiffness− increases with the characteristic frequency of the hair cell indeed constitutes a major result of our work. The reviewer seems to imply that the stiffness of the tip-link complex is determined by that of the tip link, i.e. that the tip link embodies the gating spring. As also suggested by reviewer 3 (point 1), we have clarified in the Introduction that the stiffness of the ‘tip-link complex’ cannot be reduced to that of the tip link itself, for the complex includes other proteins in series with it that may be more compliant. If the gating spring lies in series with the tip links, our results would imply a progressive change in the chemical composition of the gating spring or in the number of parallel compliant elements attached to a tip link. Notably, the tip link is still discussed as a possible component of the gating spring (Hudspeth, 2014; Araya-Secchi et al., 2016; Bartsch et al., 2018; Bartsch and Hudspeth, 2018), in particular because its detailed structure at physiological Ca2+ concentrations (~20 µM) and resting tension is unknown and also because there hadn’t been direct estimates of its stiffness through force measurements until very recently ((Bartsch et al., 2018); see below). An important finding of our work is that the estimated gradients of gating-spring stiffness are associated with gradients of tip-link tension: stiffer gating springs are subjected to more resting tension. As pointed out in subsection “Tip-link tension depends on calcium”, there could be a causal relation between the two observations if the cadherin-related molecules that constitute the tip link displayed strain stiffening, a phenomenon associated with entropic elasticity. Remarkably, this hypothesis finds strong experimental support in a preprint recently posted by the group of Jim Hudspeth in BioArXiv (https://www.biorxiv.org/search/10.1101%252F503029). One reads in the abstract of this preprint: “[…], we show that an individual monomer of PCDH15 acts as an entropic spring […]. The tip link’s entropic nature then allows for stiffness control through modulation of its tension.” Thus, finding a gradient of gating-spring stiffness may not be that surprising, even in the case where the tip link contributes to the gating spring: a uniform molecular composition of the tip link (PCDH15-CDH23) along the tonotopic axis does not necessarily imply that the stiffness of the tip link is everywhere the same. The paper also includes measurements of the MT current and bundle stiffness versus cochlear location, and the effects of calcium, though none of this is really new. As explained in the Material and methods section, the saturating magnitude of MT currents are used here to estimate the number of intact tip links (noted NTL) that contribute to stiffness and tension of a hair bundle. These measurements are not a result per se but are nonetheless important in the procedure to estimate single gating-spring stiffness and tension, as well as their gradients, leading to the major findings of our work. Measurements of MT current are also essential to discuss the origin of the negative hair-bundle movements that are observed at the onset of an EDTA iontophoritic step (Figure 4B) (see subsection “Tip-link tension depends on calcium”). In their pioneering work from the early 1980s (Strelioff and Flock, 1984), Strelioff and Flock first reported the existence of tonotopic gradients of hair-bundle stiffness in a mammalian cochlea, using the guinea pig as a model system. We confirm here the existence of tonotopic stiffness gradients of the whole hair bundle in the rat cochlea but also push much further: (i) by parsing out the relative contributions of the gating springs and the stereociliary pivots to the whole hair-bundle stiffness and (ii) by estimating stiffness and mechanical tension both at the level of the whole hair bundle and of a single gating spring. In addition, our method of hair-bundle stimulation (fluid jet moving the whole bundle) may be more controlled than fiber stimulation in these early measurements (the fiber pushed on a few stereocilia only), likely resulting in more reliable stiffness estimates. 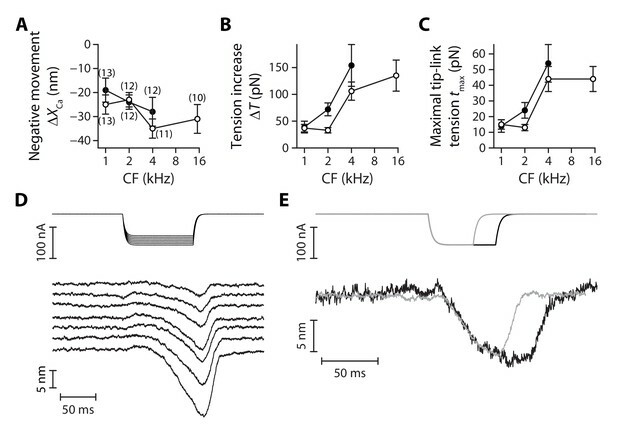 Finally, we are not aware of any other study showing that (relatively) rapid changes in the extracellular Ca2+ concentration, here via iontophoresis of a Ca2+ chelator, can evoke active movements of cochlear hair bundles of the mammalian cochlea. Similar observations have been reported with hair cells from the bullfrog’s sacculus (e.g. in Tinevez et al., (2007)), but not with cochlear hair cells from a mammalian cochlea. This observation is thus new. A significant weakness of the paper is that only a small length, the apical 20 percent, of the cochlea is sampled to derive a tonotopic gradient for outer hair cells, the conclusion being extrapolated to the remaining 80 percent. It is unclear why more basal positions were not tested when earlier work (Beurg et al., 2006) had shown this to be feasible. To provide context, the authors study only 1 to 4 kHz, where the rat upper frequency limit is at least 50 kHz. We don’t see any stiffness measurement in Beurg et al., 2006; the reviewer probably refers to Beurg et al., (2008). With OHCs, we are perfectly aware that adding data at a more basal position than the 4-kHz location, as we managed to do with IHCs, would be ideal. We recall that the main goal of our work is to provide, for the first time, estimates of tip-link tension and gating-spring stiffness in hair-cell bundles from a mammalian cochlea and to characterize their gradients along the tonotopic axis. Both tension and stiffness estimates rely on our ability to disrupt the tip links and, respectively, to measure an offset of hair-bundle position and a change in deflection amplitude upon fluid-jet stimulation. We have actually attempted to disrupt the tip links of OHC bundles at the 7 kHz location. Accordingly, we have measured the response of ~50 OHCs from 9 ears (9 different animals) to EDTA iontophoresis. However, only two cells in one ear showed a noticeable hair-bundle movement, which qualitatively resembled that shown in Figure 4A but displayed a very small amplitude. This success rate was too low to go on with experiments at this location. By comparison, at more apical locations (1-, 2- and 4-kHz locations), EDTA iontophoresis evoked robust hair-bundle movements in 45% or more of the cochleae tested. The reason for our lack of success at the 7-kHz location is unclear. In our one-compartment preparation of the cochlea, OHCs at the 7-kHz location and further towards the cochlear base might not withstand immersion in low-Ca2+ (20 µM) saline. In addition, we noticed that voltage signals produced by our position monitor (photodiodes) appeared very noisy compared to signals measured at more apical positions. The calibration constant of our photodiode system was only 4.6 ± 1.1 mV/nm (n = 11) at the 7-kHz location, which was 60% lower than the value 11.0 ± 5 mV/nm (n = 12) measured at the 4 kHz. The hair bundles of OHCs are smaller towards the base; monitoring their movements from direct imaging on photodiodes thus gets harder because the contrast of the image is lower. Because EDTA iontophoresis did not evoke robust hair-bundle movements at the 7 kHz position, we were unable to probe tip-link tension and gating-spring stiffness at this location and thus to reach our primary goal. For this reason, we did not perform stiffness measurements of the whole hair bundle at the 7-kHz location. This does not mean that the hair-bundle stiffness cannot be measured there. As pointed out by reviewer 1, Fettiplace’s group has published (though not in Beurg et al., (2006), but in Beurg et al., (2008)) stiffness measurements in 6 OHCs at a more basal location of the rat cochlea than those reported here, corresponding to a characteristic frequency of 14-kHz or equivalently to a 50% fractional distance along the cochlear axis. Although Beurg et al’s work is about probing the effects of Ca2+ on hair-bundle mechanics, we note that these measurements were performed at 1.5-mM Ca2+, not at endolymphatic concentrations (20 µM); this paper reports stiffness at low Ca2+ concentrations (20 µM) at the 4-kHz location only. It is tempting to speculate that, as we experienced, probing hair-bundle mechanics at more basal locations is very difficult, at least when the hair bundles are exposed to a low-Ca2+ saline. In our work, all tension measurements were performed at 20-µM Ca2+, which is near the natural Ca2+ concentration in endolymph (our results (Figure 6) show that tip-link tension depends on Ca2+). Note that EDTA iontophoresis as a means to disrupt tip links works well at 20-µM Ca2+, but not at 1.5-mM Ca2+ because the EDTA concentration cannot be raised high enough with iontophoresis to lower the Ca2+ concentration down to sub-μM levels. I was also concerned with the tonotopic map derived from Viberg and Canlon, (2004), when the direct measurements were present in Muller, (1991). Muller did not measure CFs less than 4 kHz for the young (P13) rats, and using his values, I would assess CFs, of 2, 4 and 7 kHz for the three OHC locations. We don’t see where in this paper (Müller, (1991)) the author refers to a difference in the tonotopic map of young rats with respect to adult rats. We have indeed considered the tonotopic map measured in adult rats (Figure 2 in this paper; tonotopic map: x(f) = 102.048 exp(-0.04357 CF) – 4.632, as reproduced in Viberg and Canlon, (2004)). Note that others have used the same tonotopic map as we did (e.g. Beurg et al., (2008)). Another weakness was that the stiffness values do not agree with previous measurements (Geleoc et al., 1997 or Beurg et al., 2008). For example, this paper reports an OHC bundle stiffness of 12 mN/m at CF= 4kHz, whereas Beurg et al., (2008) reported 3.1 mN/m and Geleoc et al., 4.5 mN/m. The latter work was done with the same technique as used here. The rapid increase between 2 kHz and 4 kHz (Figure 3A) is suspicious. In view of these concerns, I feel the paper would be better placed in a less high-profile journal such as Biophysical Journal or JARO. Following the reviewer’s criticism, we have carefully reevaluated our calibration procedure of the fluid jet. This led to the identification of a systematic error corresponding to the overestimation of the forces applied by the fluid jet (and thus stiffness) by a factor ~3/2; all the data, statistical tests and figures were updated to account for this error. As detailed below, we have validated our calibration procedure by performing a control experiment in which we compared stiffness measurements with the fluid jet and with a flexible fiber using hair cells from the frog sacculus. We thank the reviewer for helping us find this error and thus improve the reliability of our stiffness estimates. Note that a systematic error in force measurements does not affect the conclusions of our paper, e.g. the existence of gradients in gating-spring stiffness and tension. After correction, the hair-bundle stiffness in outer hair cells at the 4-kHz position is found to be 8.6 mN/m. This value is still higher than those reported by Geleoc et al., 1997 and Beurg et al., (2008) but we explain below why the published values may represent underestimates of the actual stiffness. We now discuss why previous stiffness estimates from the literature may be different than ours. In Geleoc et al. 1997, the authors probed hair-bundle mechanics in neonatal OHCs (P1-2) from the mid-apical coil of the mouse cochlea after these cells had been maintained in culture for 1-4 days. We worked instead on acute preparations of the rat cochlea at P7-10. Geleoc’s preparation is thus quite different from ours and whether stiffness estimates can be directly compared between the two preparations is unclear. In addition, these authors considered that the velocity of the fluid coming out of their fluid-jet pipette is uniform along an axis perpendicular to the longitudinal axis of the pipette and that the jet is cylindrical. In contrast, our detailed characterization of the velocity field produced by a fluid jet demonstrates that the jet is conical and that the fluid-velocity profile is peaked (Figure 2—figure supplement 1 and Figure 2—figure supplement 2). Ignoring these features results in an underestimate of the drag force that is applied on a hair bundle, and in turn of the hair-bundle stiffness. This may explain, at least in part, why our stiffness estimates are higher than in Geleoc et al., 1997. In addition, Geleoc et al., estimated that the effective point force that one would have to apply at the bundle’s top to get the same deflection as that evoked by the fluid jet was half the total drag force applied by the fluid jet. This would be true if the drag force were uniformly distributed along the bundle’s height, which is very unlikely considering the no-slip condition at the apical surface of the hair cell. As detailed above (text in blue font), we estimate instead that the correction ought to be closer to 3/2. Thus, from this factor alone, Geleoc et al., might have underestimated the hair-bundle stiffness by a factor 4/3. Finally, note that we measured stiffness 5-10 ms after the onset of step stimuli, which corresponds to the ‘dynamic stiffness’ in Geleoc et al., 1997 (measured in their case 4 ms after the stimulus onset): this ‘dynamic stiffness’ is found to be 5.6 mN/m, thus 25% higher than the ‘steady-state stiffness’ (measured 45 ms after the stimulus onset) of 4.5 mN/m mentioned by the reviewer. With the correction factor 4/3, the stiffness estimates rises to a value of 7.5 mN/m, which is comparable to our current estimate. In Beurg et al., 2008, the authors used a flexible glass fiber with a silicone bead at its tip to deflect the hair bundle. As pointed out by reviewer 1, we use a different stimulation technique: the fluid jet. With fiber stimulation, only motion at the fiber’s tip is measured; the underlying hair bundle is not visualized. In addition, the force applied to the bundle is somewhat distributed among the different stereocilia; the contact zone between the silicone bead and the bundle is poorly characterized (Nam et al., 2015). It is thus unsure that all the stereocilia are recruited in concert by this stimulation technique. Because OHC bundles are known to be weakly cohesive, stimulation of a subset of stereocilia would result in an underestimate of hair-bundle stiffness. As a matter of fact, finite-element simulations of the hair-bundle response to fiber stimulation suggest that the estimated stiffness in OHCs was 45% smaller than the actual stiffness (Nam et al., 2015). Applying this correction, the stiffness of OHC bundles at the 4-kHz location would be ~7 mN/m. With these caveats in mind, hydrodynamic stimulation may be advantageous. In accordance with a more cohesive motion of the hair bundle and/or tighter coupling between the stimulus and bundle motion in response to a fluid jet, the current-displacement relation resulting from fluid-jet stimulation has been shown to be much narrower (5-95% width: ~100 nm) than that measured with fiber stimulation (5-95% width: ~500 nm; compare Figure 1E to Figure 3C in Johnson et al., (2011)). 1) Impact statement: “The mechanical properties of the tip-link complex contribute to frequency selectivity of auditory hair cells”. See also Discussion section: “tip-link complex plays a role in setting the CF of the hair cell”. To my knowledge there is no evidence to support these contentions. 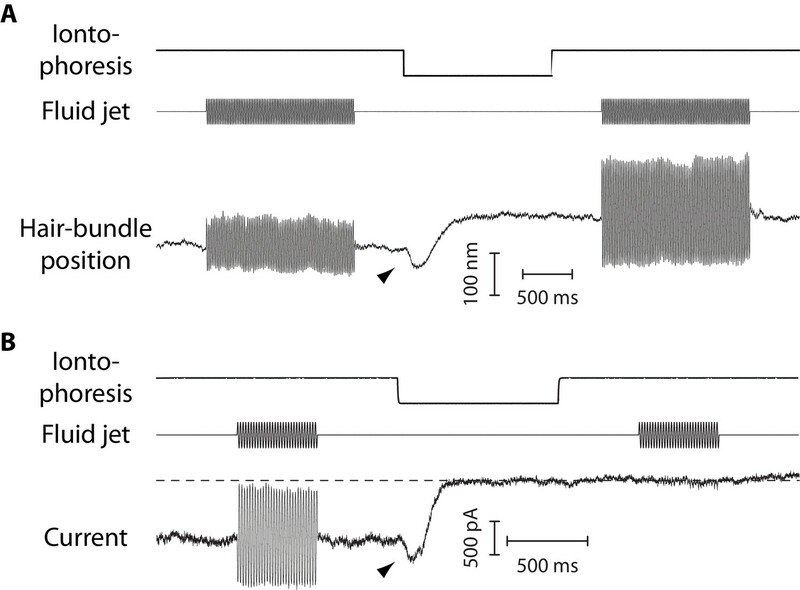 Moreover, the present consensus (see e.g., work by Grosh and colleagues) is that prestin-based somatic contractility is sufficient to account for cochlear amplification. Although our findings provide no direct proof that the observed tonotopic gradient in stiffness and tension of the tip-link complex plays a role in setting the characteristic frequency of the hair cell, they reveal a striking covariation of the mechanics of the tip-link complex and of the characteristic frequency of the hair cell. Our work thus adds to the available evidence indicating that multiple physical properties of the hair cell are tuned according to the cell’s characteristic frequency, especially in outer hair cells. To the very least, our work opens an avenue for further research and modelling, which ought to determine whether and how stiffness and tension of the tip-link complex influence the characteristic frequency of the corresponding hair cell. The reviewer implies that there is no need for implicating the tip-link complex in frequency tuning of the hair cell because electromotility is sufficient to account for cochlear amplification. There is no doubt that electromotility is necessary for frequency-selective cochlear amplification but electromotility, by itself, displays a flat frequency response to sinusoidal variations of the transmembrane potential (Frank et al., 1999) and thus provides no frequency tuning. Frequency-selectivity instead results from a complex (and still unclear) interplay between electromotility and its mechanical load. This load includes the hair bundle, whose mechanical properties are determined in part by those of the tip-link complex as shown here (Figure 3) and by others (Hudspeth, (2014)). Notably, there is evidence at the cochlear apex of the Mongolian gerbil that the tip-link complex may contribute significantly to the mechanical impedance of the cochlear partition (Chan and Hudspeth, (2005)). Finally, the work of Karl Grosh’s group in fact acknowledges a potential role of the hair bundle in cochlear amplification, at least at the apical end of the cochlea (see the Discussion section in Meaud and Grosh, (2011)). Still, the reviewer’s comment made us realize that our significance statement may lead to some misunderstanding. We now propose: “The tip-link complex of the hair cell is mechanically tuned along the tonotopic axis of the cochlea.” In addition, we have toned down our assertion about the significance of our observation for frequency selectivity at the end of the first paragraph of the Discussion section, which now reads: “In return, our data raise the possibility of a mechanical role of the tip-link complex in the process that sets the characteristic frequency of the hair cell”. We changed the sentence, which now reads: “Computing the stiffness ratio between the most basal and the most apical cochlear location that we were able to probe, […]”. We have deleted the paragraph suggesting that the gradient of gating-spring stiffness may be related to the gradient in the number of MT channels. Based on available estimates of the single-channel gating force for cochlear hair cells, we agree that it is not surprising to observe linear force-displacement relations with hair bundles as stiff as those studied here. However, there are reasons to believe that gating forces in mammals may have been underestimated. First, adaptation appears to be so fast in the mammalian cochlea that it is difficult to apply step stimuli that are brisk enough to outspeed adaptation in measurements of current-displacement or force-displacement relations. It has been suggested that strong gating compliance may be masked by fast adaptation at short timescales after the onset of a step stimulus (Tinevez et al., (2007)). Second, the magnitude of the gating force may depend on experimental conditions. With hair cells from the bullfrog sacculus, hair bundles are endowed with only weak gating compliance in a one compartment configuration with standard saline containing 4-mM Ca2+ (single-channel gating force of ~0.3 pN in Howard and Hudspeth, (1988)). Instead, one can observe gating compliance that is strong enough to result in negative hair-bundle stiffness in a two-compartment configuration that recapitulates natural conditions (single-channel gating force up to ~0.9 pN in Martin et al., (2000); see also Figure S1 in Tinevez et al., (2007)). With a single-channel gating force of 0.9 pN, the stiffness of an OHC at the 4-kHz location in the rat cochlea would be reduced by 3.3 mN/m as the result of gating compliance, corresponding to nearly 40% of the measured stiffness (using the corrected value 8.6 mN/m): gating forces as high as those measured in frog would thus produce noticeable gating compliance with hair bundles as stiff as those studied here. There is actually a report of a two-compartment preparation of the Mongolian gerbil’s cochlea that showed mechanical nonlinearities at the level of basilar-membrane vibrations that are likely the result of gating forces (Chan and Hudspeth, (2005). Thus, gating compliance could be more visible under circumstances where the endolymphatic/perilymphatic compartments (and perhaps also the endocochlear potential) are preserved. Finally, mechanical stimulation with a fluid jet consistently results in narrower current-displacement relations than stimulation with a glass rod, resulting to larger estimates of the gating forces with the fluid jet (Johnson et al., (2011)). Although these considerations are interesting, we felt that they go beyond the scope of our paper. […] There is a problematic issue in subsection “The hair-bundle stiffness increases along the tonotopic axis”. It is surprising a first glance that the authors mention neither adaptation and the consequential changes in hair-bundle stiffness, nor gating compliance owing to the opening of transduction channels. This is worrisome inasmuch as the lack of these signatures might imply unhealthy cells. Onlyin subsection “Mechanical stimulation and stiffness measurements” do the authors report the time-dependent changes characteristic of adaptation, which they later demonstrate in Figure 2—figure supplement 4. Moreover, they subsequently mention the period of 5-10 ms after the onset of stimulation at which measurements were made, an interval likely to miss gating compliance owing to the swift adaptation of mammalian hair cells. Note in that context the transient at the outset of the single record with a high temporal resolution (Figure 2—figure supplement 3). Finally, in subsection “Tip-link tension depends on calcium” they state that "gating forces were relatively weak under our experimental conditions," when really their measurement conditions probably precluded the detection of these forces. It would be useful to state at the outset that the principal measurements reflect "steady-state" stiffnesses or the like, and perhaps to note that adaptation was probably observed but was not relevant, and that gating compliance might have been missed for technical reasons. These are good suggestions and we have amended the text in the subsection “The hair-bundle stiffness increases along the tonotopic axis” accordingly. […] 1) It is important to be clear that the changes observed with BAPTA treatment are not necessarily limited only to tip-link proteins but anything in series with these proteins. The tonotopic changes described may be a reflection of intrinsic tip link properties but they also can be a reflection of changes described for the TMC proteins, upper insertion point proteins and even the lipid bilayer. The authors do allude to this idea in several places (using the term tip link complex), but it comes across a bit confused and it is unclear when they mean only the tip-link proteins and when they include accessory structures. The discussion of potential intrinsic tip- link protein effects is reasonable, it simply needs to be expanded to be inclusive as there is no clear data one way or the other. To estimate the drag force exerted by the fluid jet on a hair bundle, we modeled the hair bundle by a prolate ellipsoid with the long and short axis corresponding to the width (W) and height (h) of the hair bundle, respectively. The expression of the hydrodynamic radius of the ellipsoid (Equation 1) takes into account the height (as well as the width) of the hair bundle; it thus changes along the tonotopic axis of the cochlea. In other words, the force exerted by the fluid jet is expected to vary from one location to the next as the result of tonotopic changes in hair-bundle size, but we accounted for that. In practice, however, the effect is small, nearly negligible (see Figure 3—source data 1). This is not surprising considering that the height of the hair bundle decreases by only 13% and 23% in inner and outer hair cells, respectively, from the apical-to-basal cochlear locations that we probed in our work. In principle, a change in bundle height results in a change in the correction to the expression of the hydrodynamic radius that we use to calculate the drag force on the hair bundle, potentially affecting the gradients that we measure. However, the height varies by less than 25% in our experiments, whereas the observed mechanical gradients correspond to variations that are much larger (e.g. increase of 240% for the stiffness of outer hair cells between the 1- and 4-kHz locations). Thus, the effect of the surface on the bundle’s hydrodynamic radius as a function of cochlear location should contribute marginally to the observed mechanical gradients. In other words, it is unlikely that a differential effect of the surface on the force applied by the fluid jet contributes significantly to the observed mechanical gradients. The new control experiment that we have added to the manuscript to probe the validity of our force-calibration procedure (in frog; Figure 2—figure supplement 4) also indicates that the approximate expression for the hydrodynamic radius (Equation 1) of the hair bundle provides satisfactory results (see also the added text in the subsection “Applying and measuring forces with the fluid jet”), i.e. that the surface has a weak effect on this expression. These are interesting suggestions but we felt that they go beyond the scope of the present work. Of course, if tip-link tension were regulated by Ca2+ at an intracellular site then we agree that any mechanism that modulates the Ca2+ concentration at the regulation site would be relevant, including changes of the transmembrane potential or of Ca2+ buffering. Cochlear amplification is viewed as a frequency-selective ‘active process’, because it cannot be reduced to one of its components, including somatic electromotility, basilar-membrane or hair-bundle mechanics. For instance, although we know since the pioneering work of Georg von Bekesy that the basilar membrane is endowed with a passive resonant behavior, the characteristic frequency of a local section of the (healthy) cochlear partition can be higher or lower than the local (passive) resonance frequency of the basilar membrane that can be assayed post mortem. Amplification and frequency selectivity appear instead as emergent properties of the dynamic interplay between all the vibrating components of the cochlear partition (Hudspeth et al., 2010; Ó Maoiléidigh and Jülicher, 2010; Meaud and Grosh, 2011; Hudspeth, 2014). One cannot really separate amplification from frequency tuning, for amplification is frequency selective and thus provides active filtering of sound inputs. We have expanded the conclusion of the manuscript along these lines and now write: “Thus, the division of labor between inner and outer hair cells may impart more stringent regulatory constrains to outer hair cells to tune their mechanoreceptive antenna according to the local characteristic frequency of the cochlear partition. However, the exact contribution of the hair bundle to frequency tuning remains unsure and, more generally, the mechanism that specifies the characteristic frequency remains a fundamental problem in auditory physiology. This may be in part because frequency selectivity cannot be ascribed to one element only, for instance the passive resonant property of the basilar membrane that was characterized in the pioneering work of von Bekesy (Von Békésy and Wever, 1960). Various models of cochlear mechanics instead indicate that the characteristic frequency emerges from an active dynamic interplay between somatic electromotility of outer hair cells (Ashmore, 2008) and the micromechanical environment, including the basilar and tectorial membranes, as well as the hair bundle (Nobili and Mammano, 1996; Hudspeth et al., 2010; Ó Maoiléidigh and Jülicher, 2010; Meaud and Grosh, 2011; Hudspeth, 2014; Reichenbach and Hudspeth, 2014). Mechanical tuning of the inner constituents of the cochlear partition appears to happen at many scales: from the mesoscopic scale of the basilar and tectorial membranes, to the cellular scale of the hair bundle and hair-cell soma, down to the molecular scale of the hair cell’s transduction apparatus. Our work demonstrates that tonotopy is associated, in addition to other factors, with stiffness and tension gradients of the tip-link complex. Thank you for evaluating our manuscript favorably. To address the remaining concern of two of the reviewers, we have further emphasized throughout the text of our revised manuscript that we explored only part of the tonotopic axis. Note that our work deals with both inner and outer hair cells and that the range of positions covered for inner hair cells (50% of the tonotopic axis; CF 1-15 kHz) was larger than that for outer hair cells (20% of the tonotopic axis; CF 1-4 kHz). With the changes listed below, we believe that we can’t give a misleading impression to the reader. It is clear that future work ought to determine whether or not the mechanical gradients that we reveal here within the apical half of the cochlea extend to a larger portion of the tonotopic axis. With the data and techniques at hand, it is currently difficult to argue one way or another. We thank Benoît Lemaire and Rémy Fert from the machine shop of the Curie Institute, Prof. Walter Marcotti for help in the design of our fluid-jet device, Jérémie Barral for a critical reading of the manuscript and Christine Petit for fruitful discussions. This research was supported by the French National Agency for Research (ANR-11-BSV5 0011 and ANR-16-CE13-0015) and by the Labex Celtisphybio ANR-10-LABX-0038. MT is an alumnus of the Frontiers in Life Science PhD program of Université Paris Diderot and thanks the Fondation Agir pour l’Audition for a doctoral fellowship. AC was supported by a PhD fellowship from the European Union Horizon 2020 research and innovation program under the Marie Skłodowska-Curie grant agreement No 66600. Animal experimentation: All experimental procedures were approved by the Ethics committee on animal experimentation of the Institut Curie; they complied with the European and French National Regulation for the Protection of Vertebrate Animals used for Experimental and other Scientific Purposes (Directive 2010/63; French Decree 2013-118). © 2019, Tobin et al.